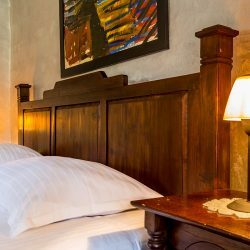 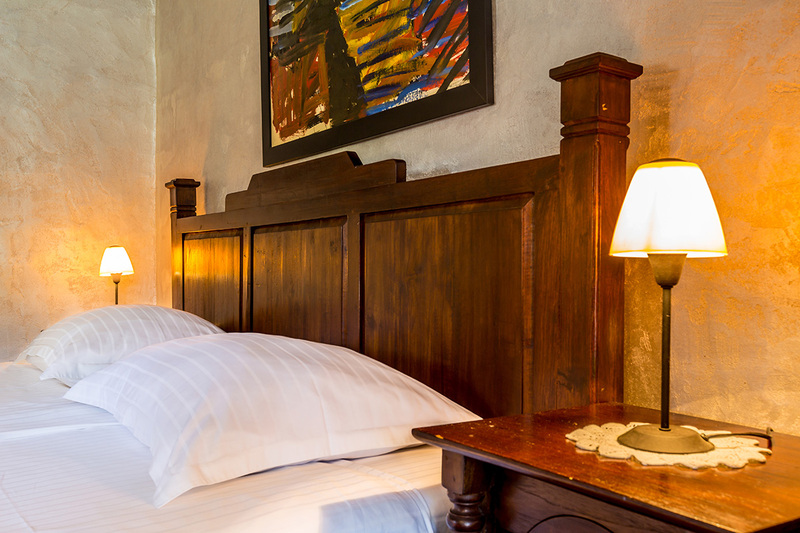 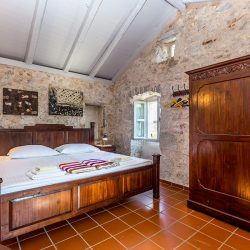 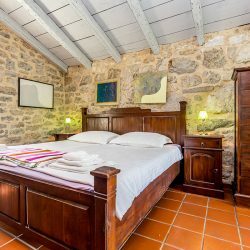 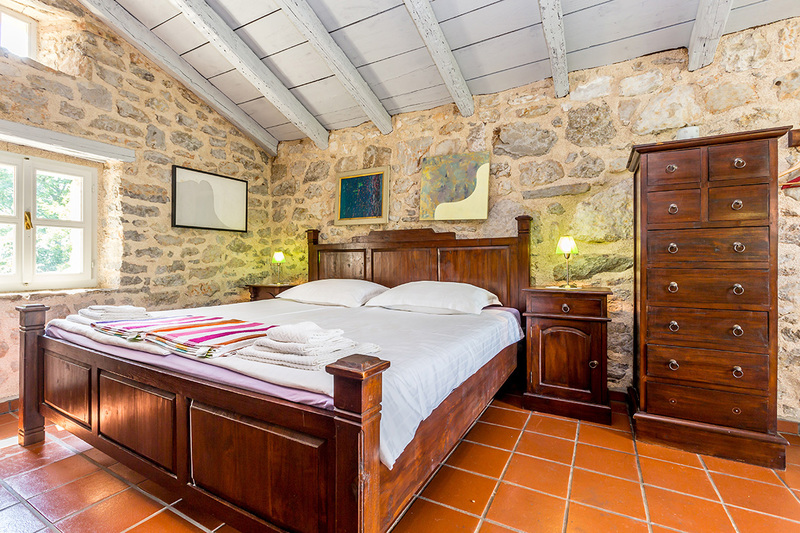 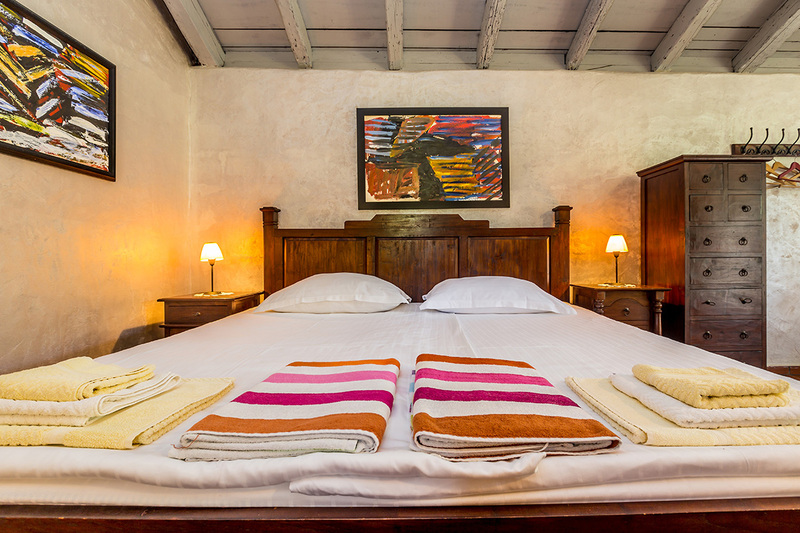 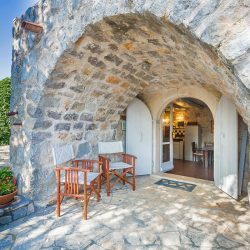 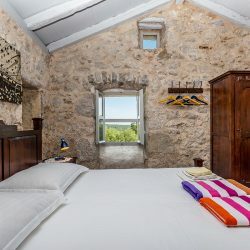 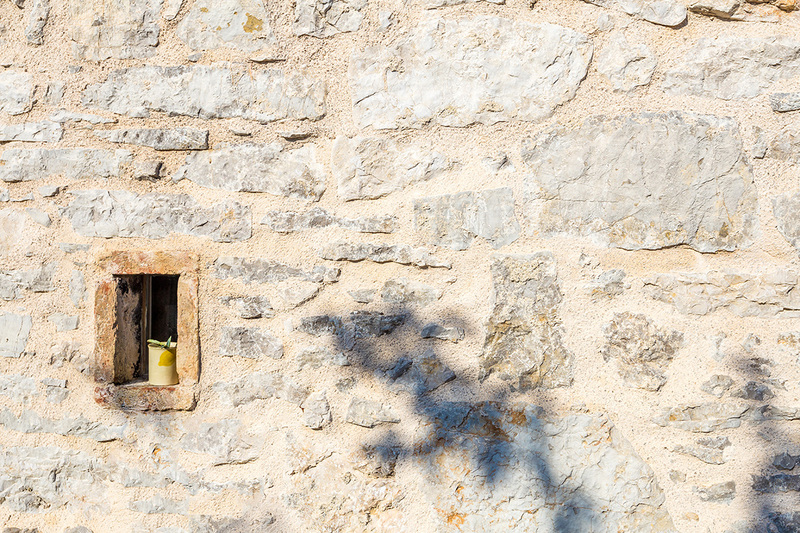 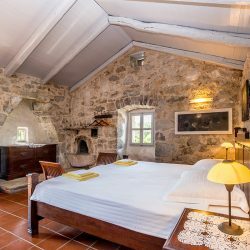 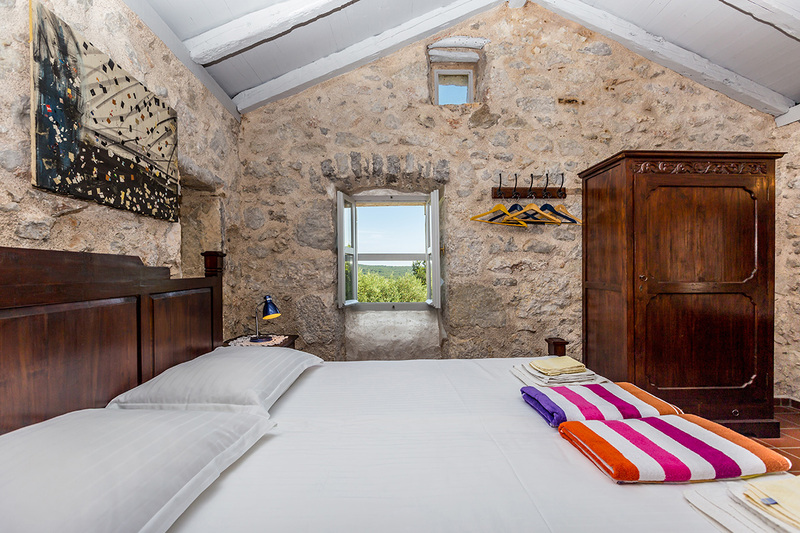 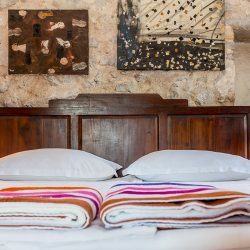 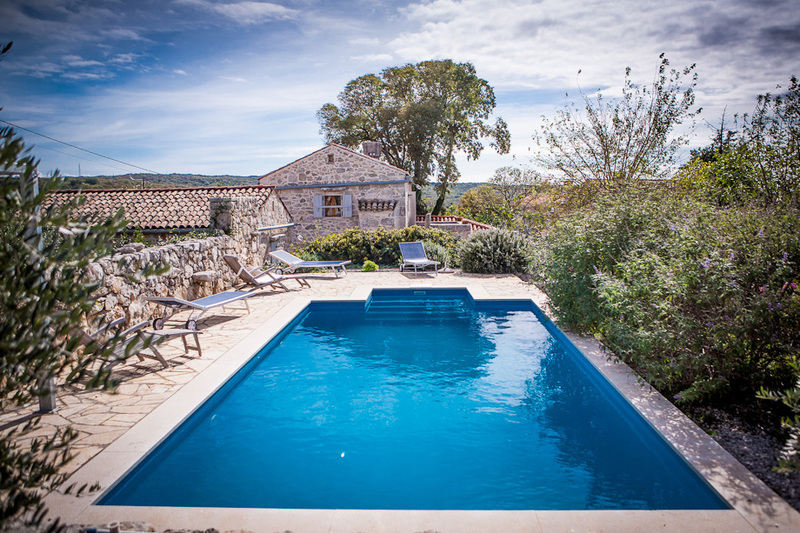 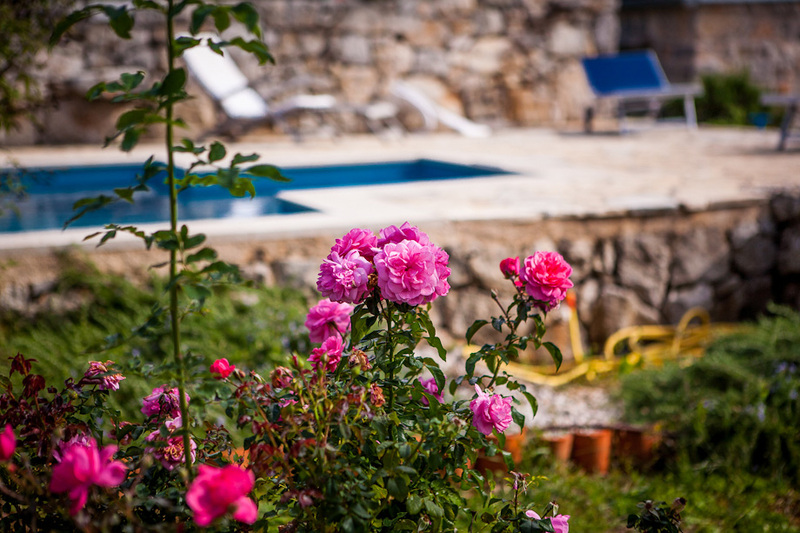 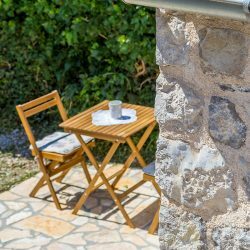 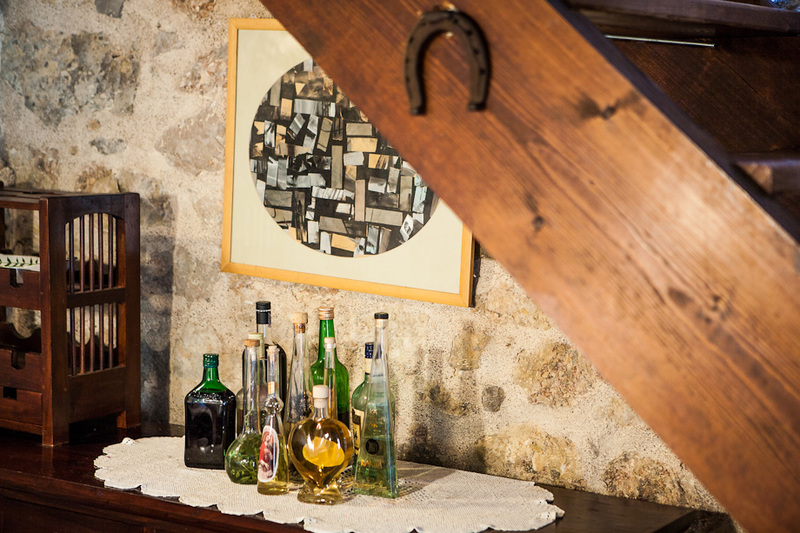 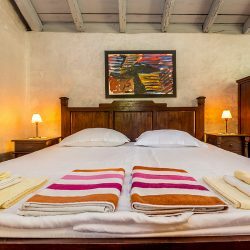 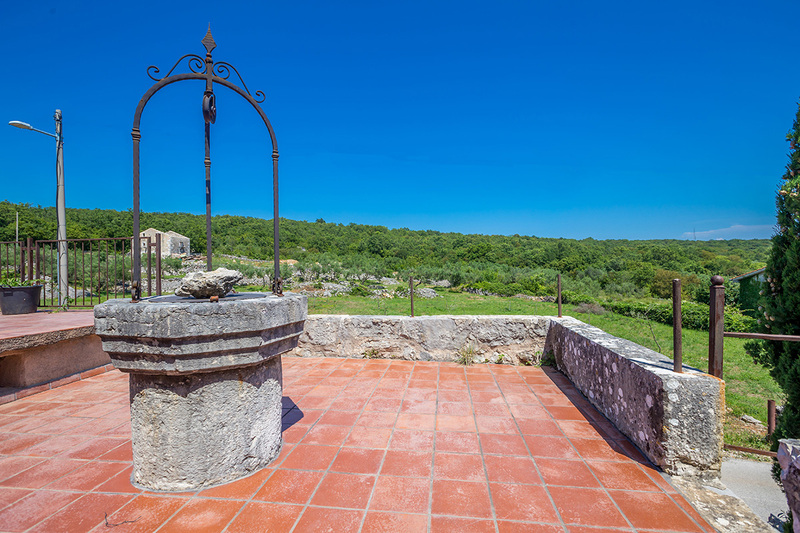 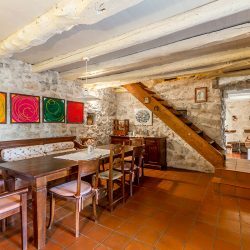 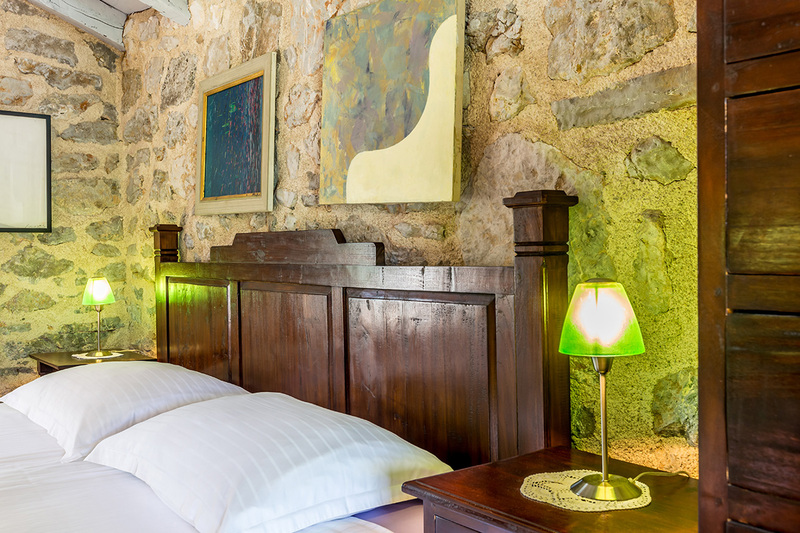 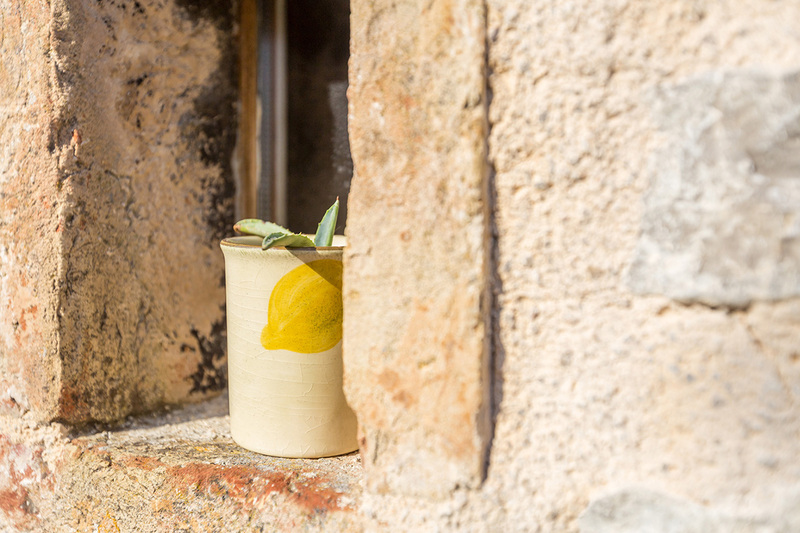 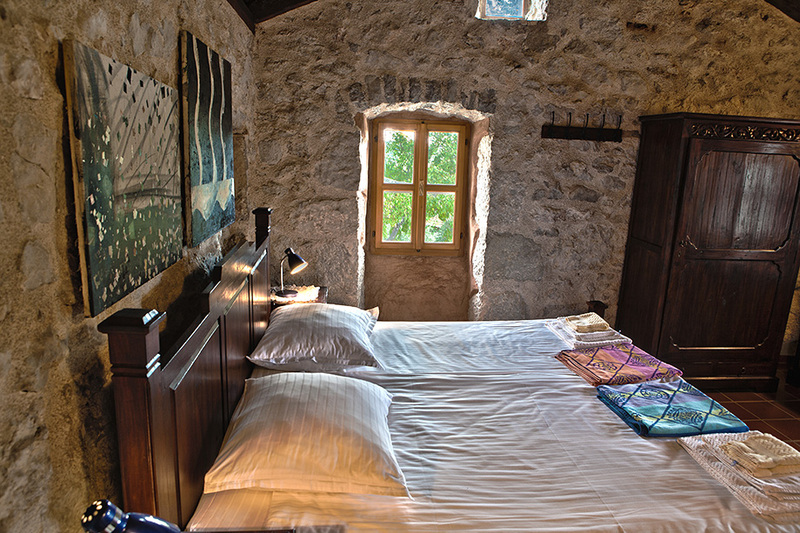 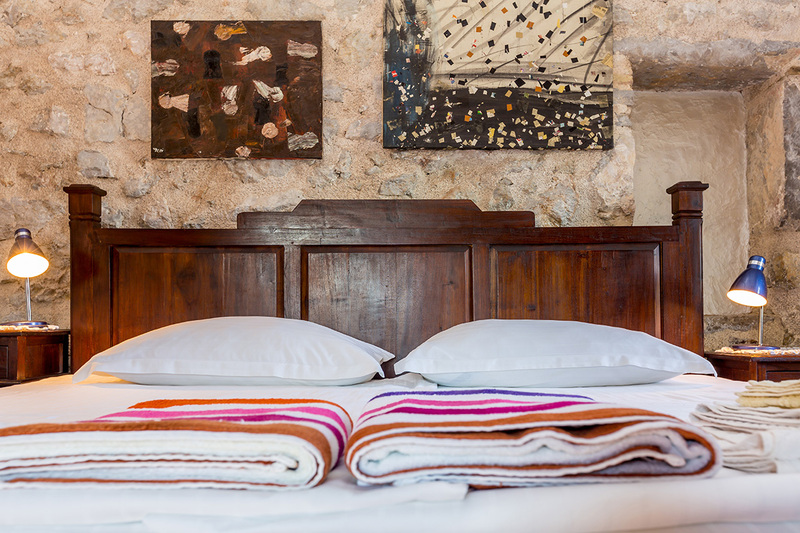 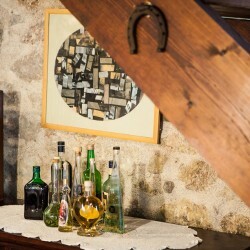 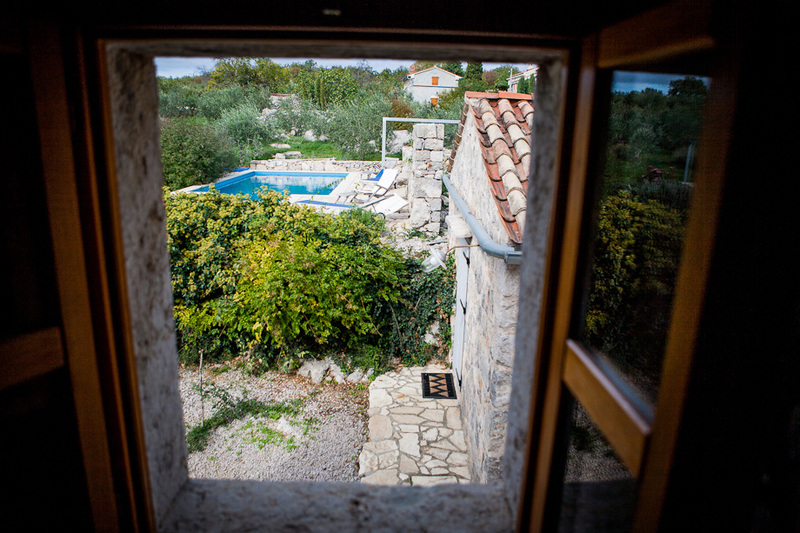 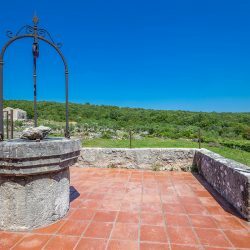 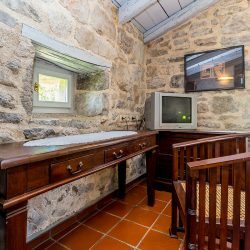 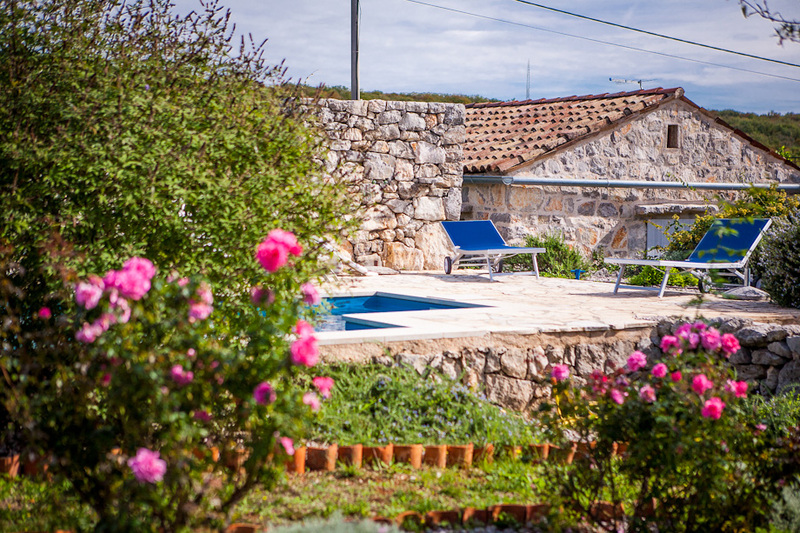 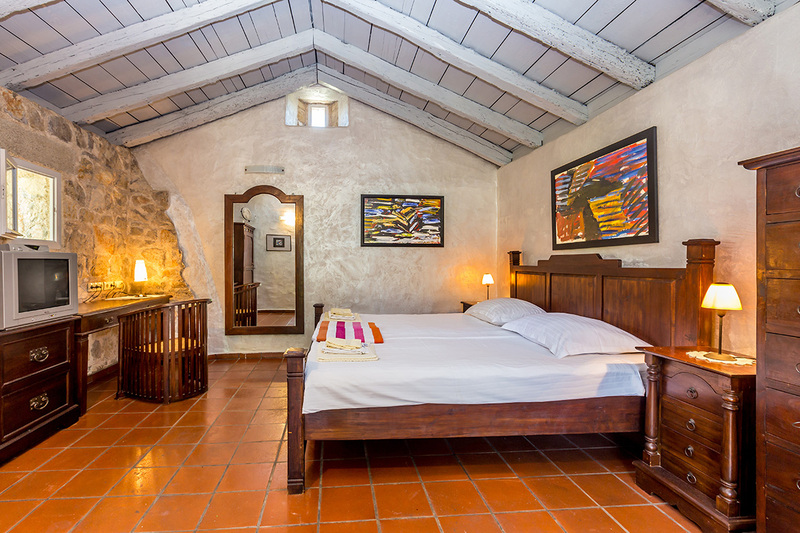 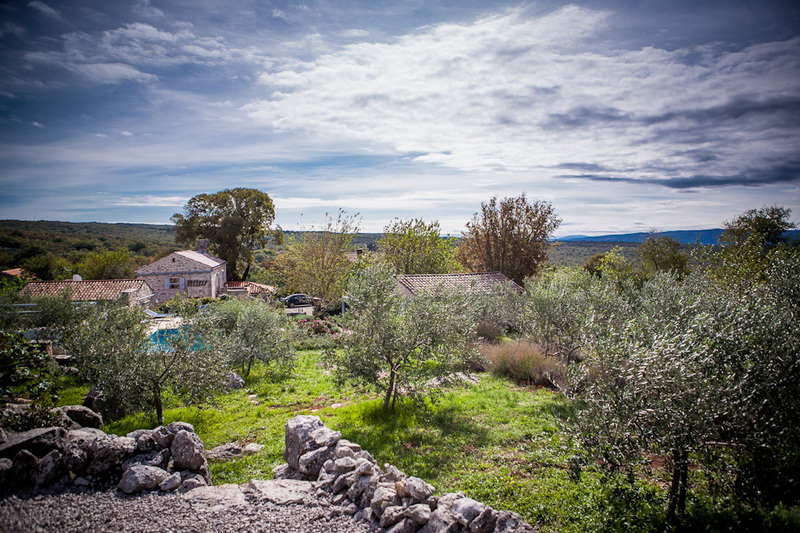 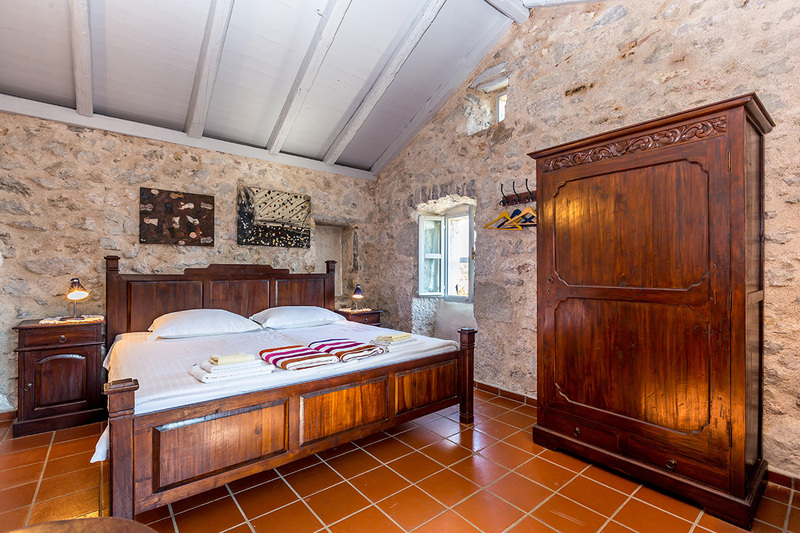 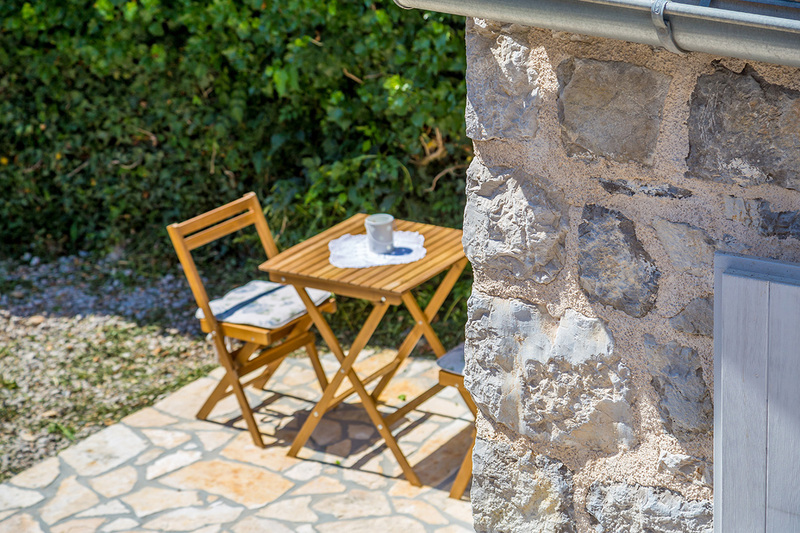 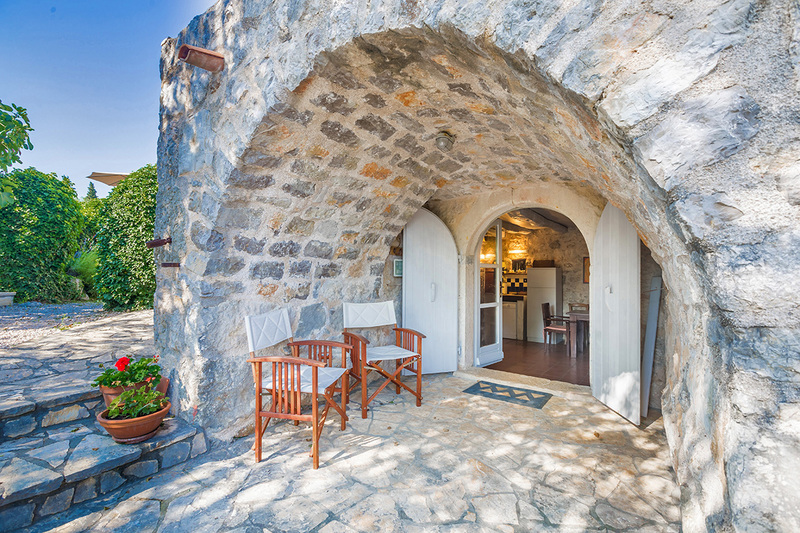 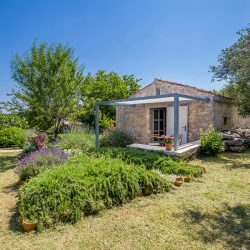 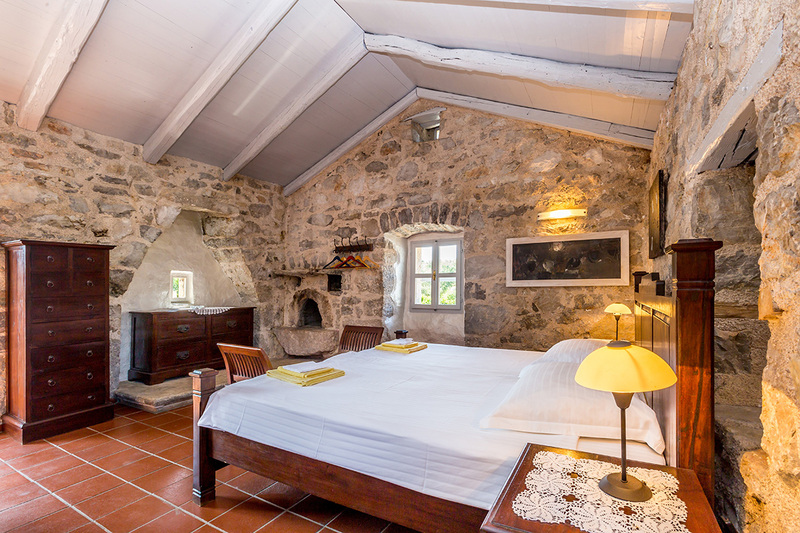 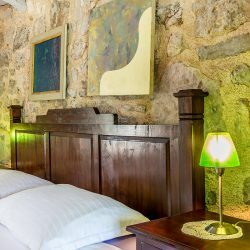 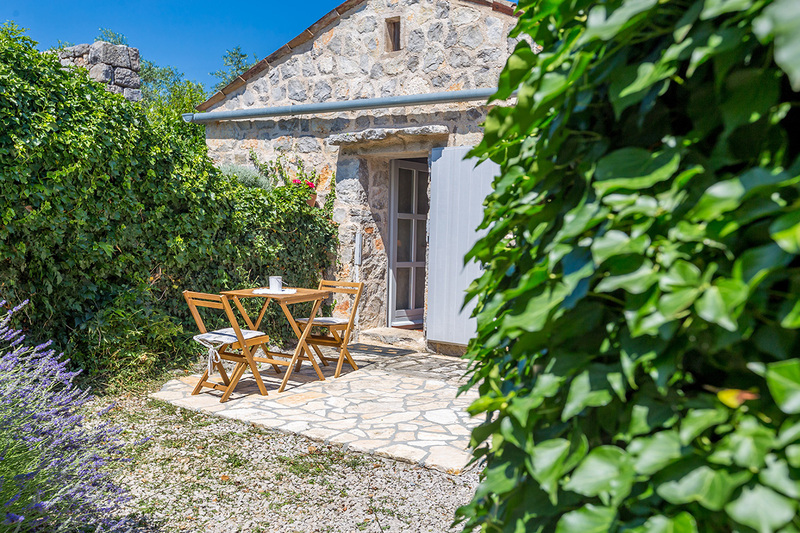 If You want to spend Your vacation in complete peace, listening only to the sounds of nature and birds singing, being surrounded by an insane amount of shades of colour green – we are offering You a stay in a little village of Kapovci, in our traditional, rustic Villa Maria. 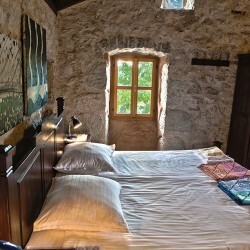 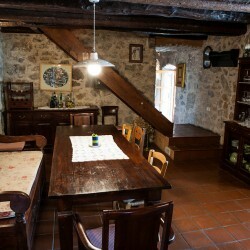 The Villa is a complex made from three houses built in 1770. 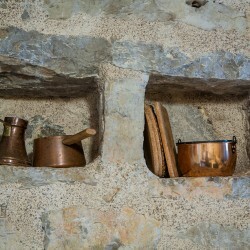 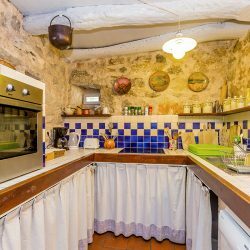 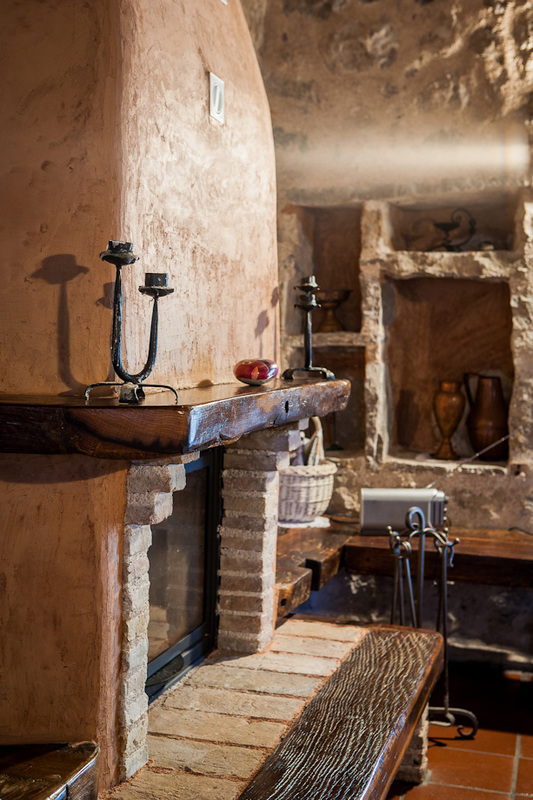 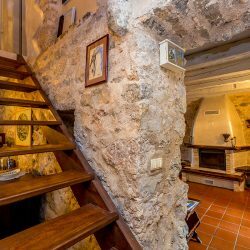 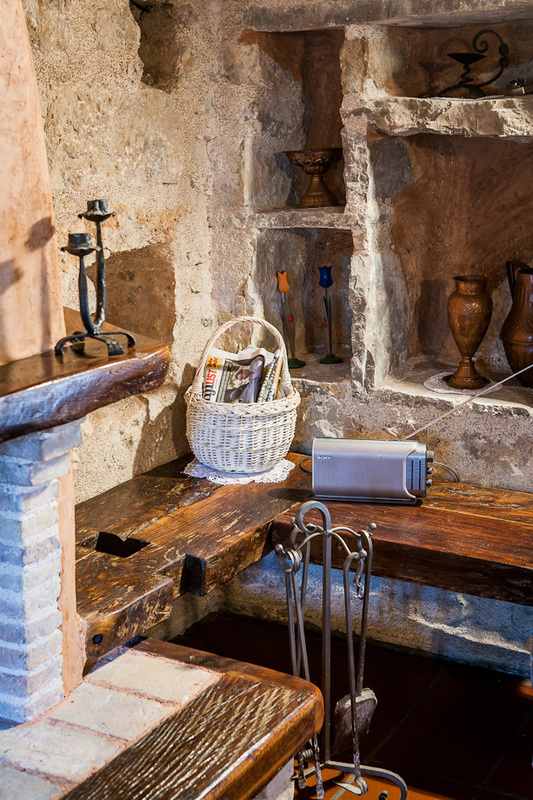 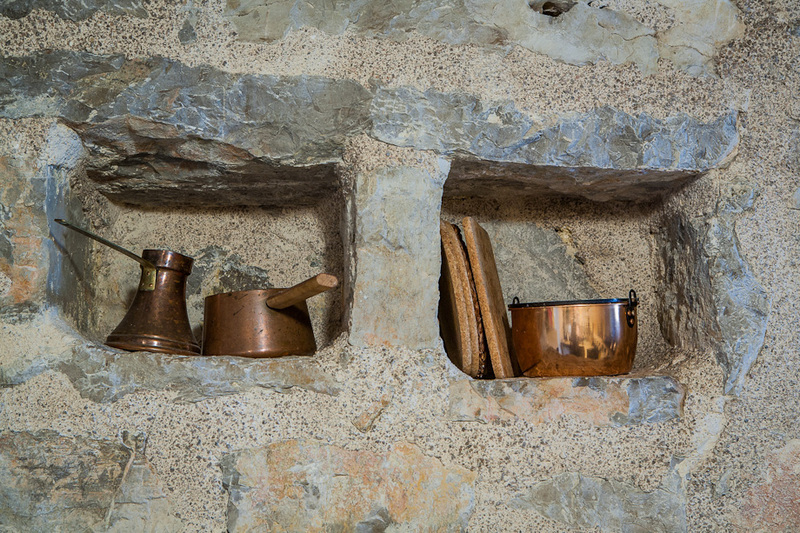 It’s a real rustic house from the past times ; it’s not an imitation like many of them on the market today; it offers You all the things only old, rustic buildings can offer. 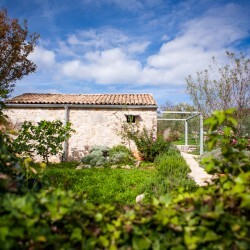 It really is an ideal place for nature enthusiasts to escape the city rush and noise. 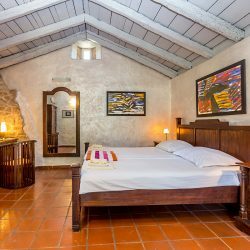 The estate consists of the main house with a big porch, a living room, kitchen with a spacious dining room on the ground floor, and the sleeping area separated into two bedrooms and one bathroom on the first floor. 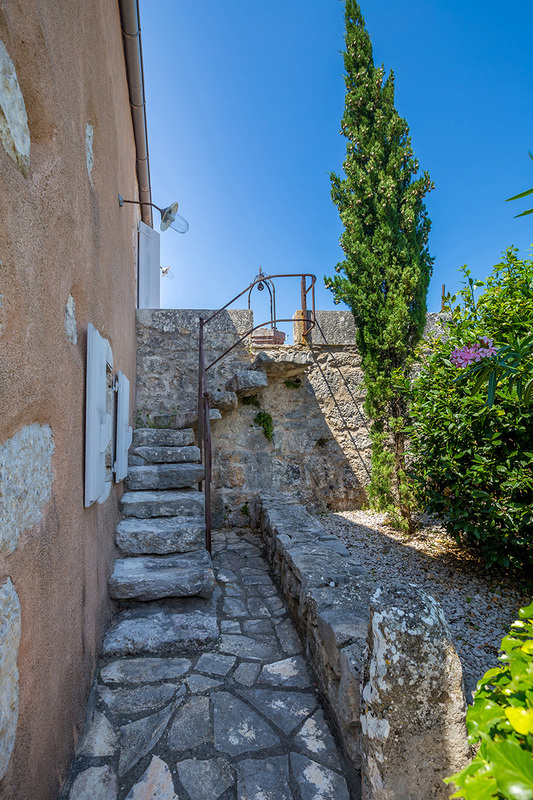 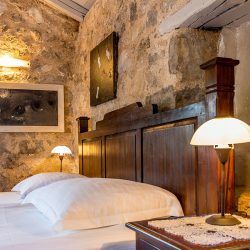 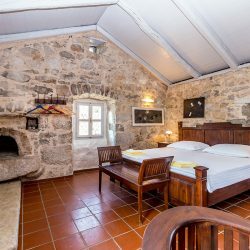 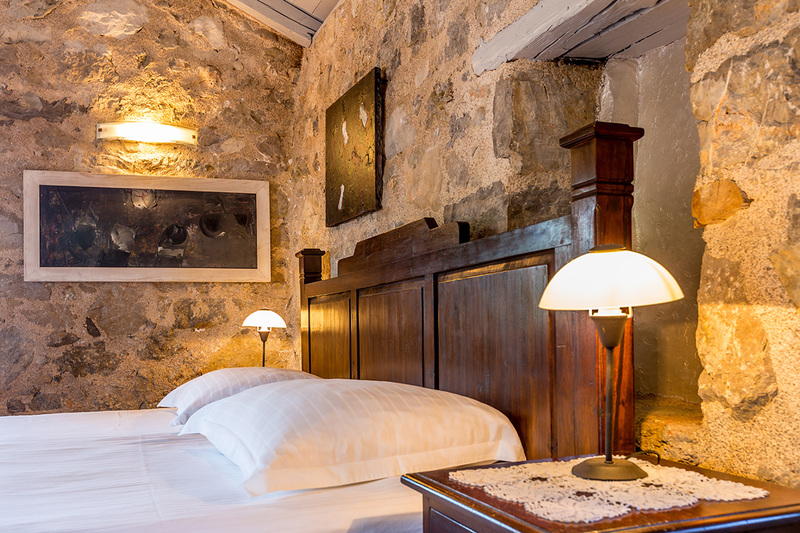 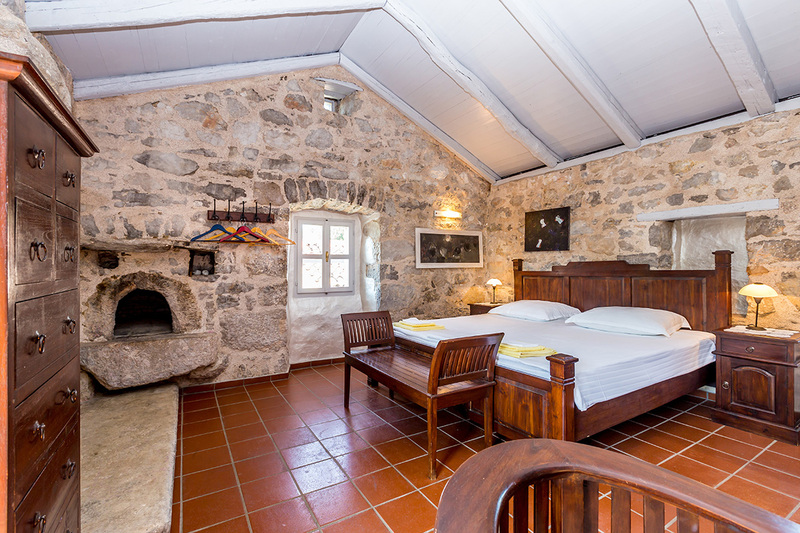 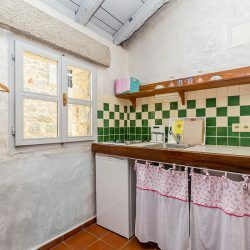 Next to the main house we can find two smaller apartments, spacious enough for a couple, that consist of a bedroom, a little kitchen, and a bathroom. 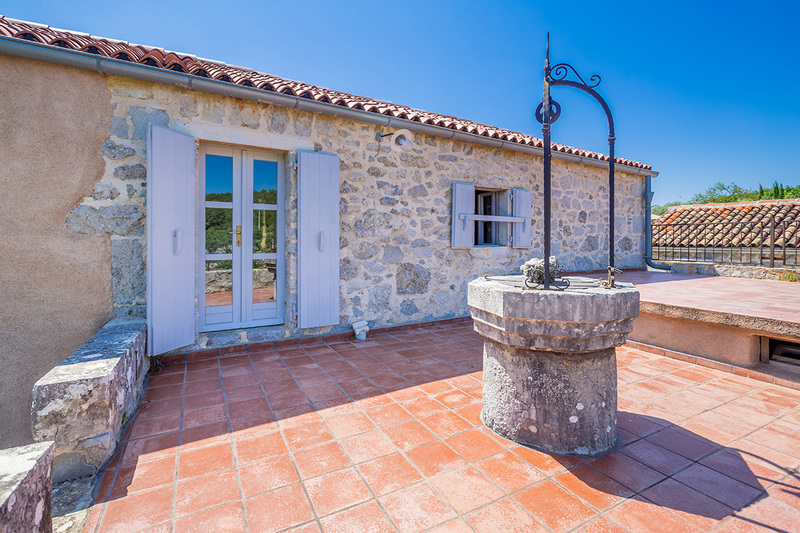 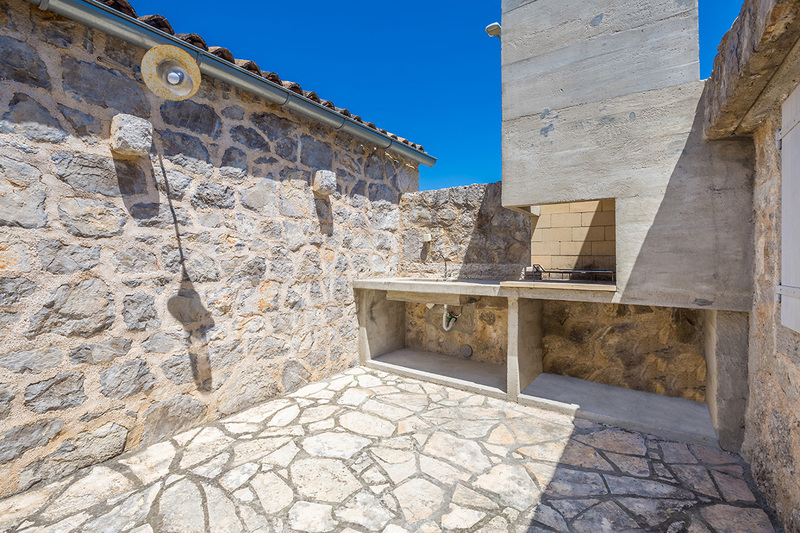 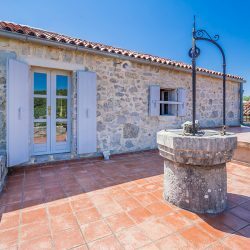 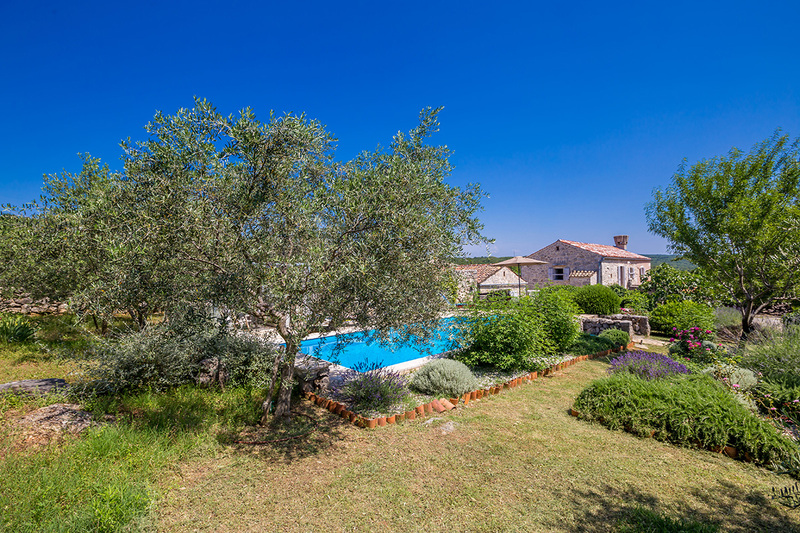 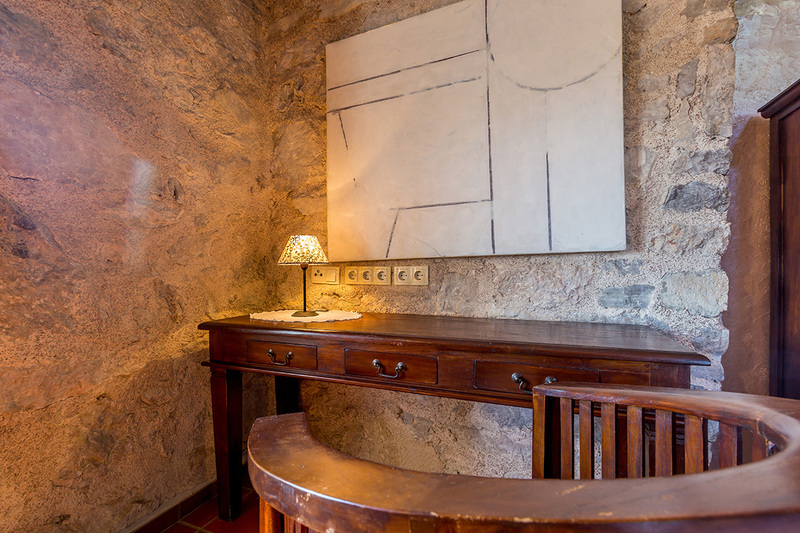 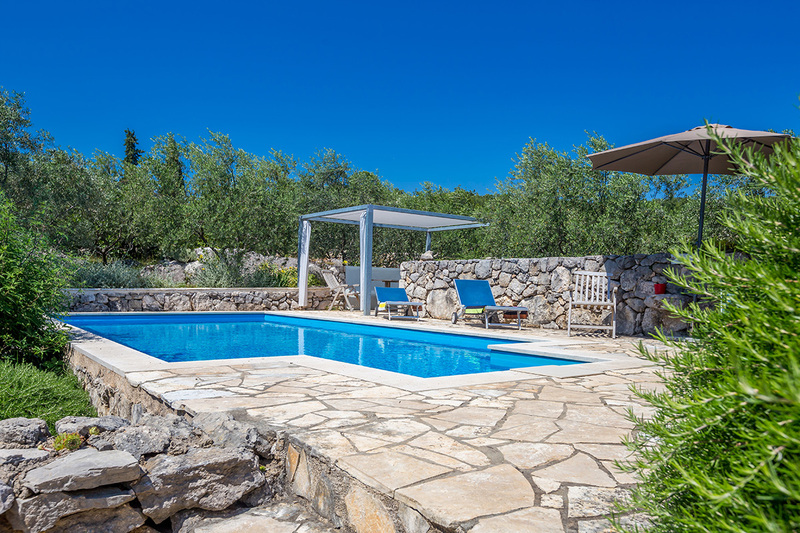 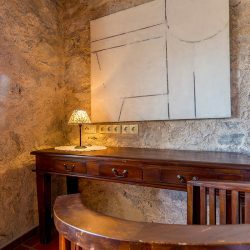 Since Villa Maria is situated in a village that counts only 7 people, You can be certain You’ll be able to enjoy complete intimacy and privacy in the house, but also in the swimming pool area. 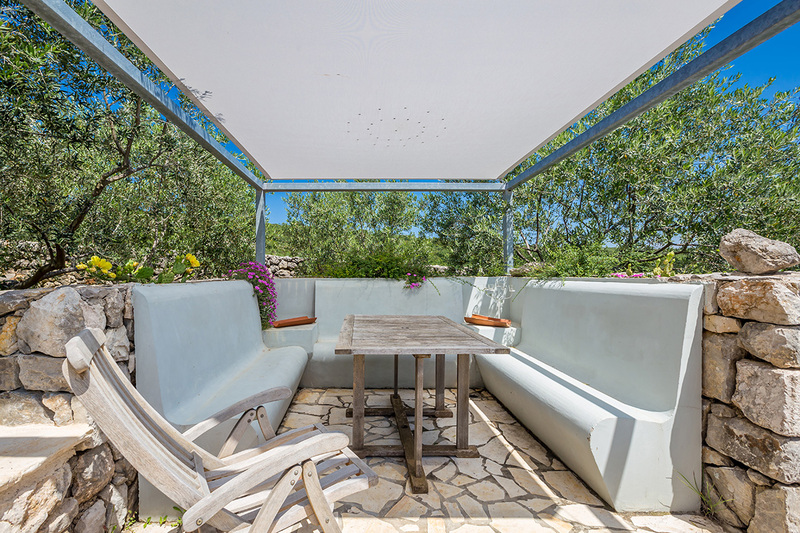 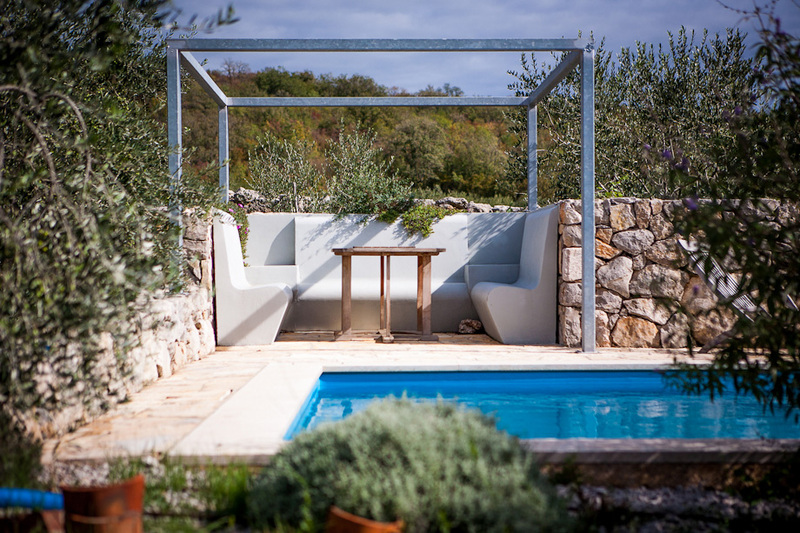 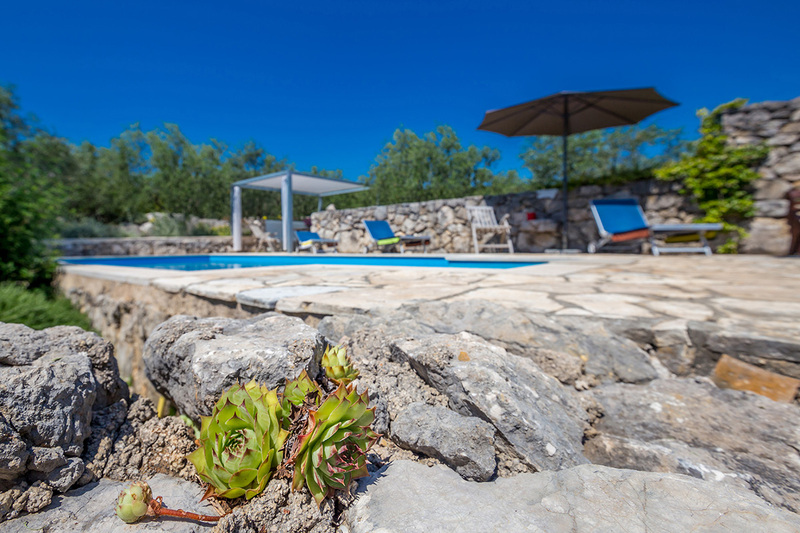 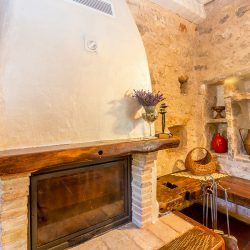 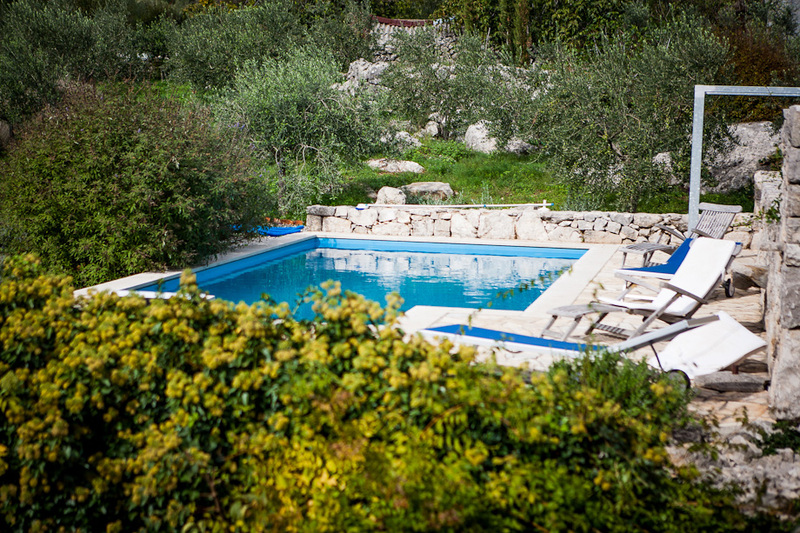 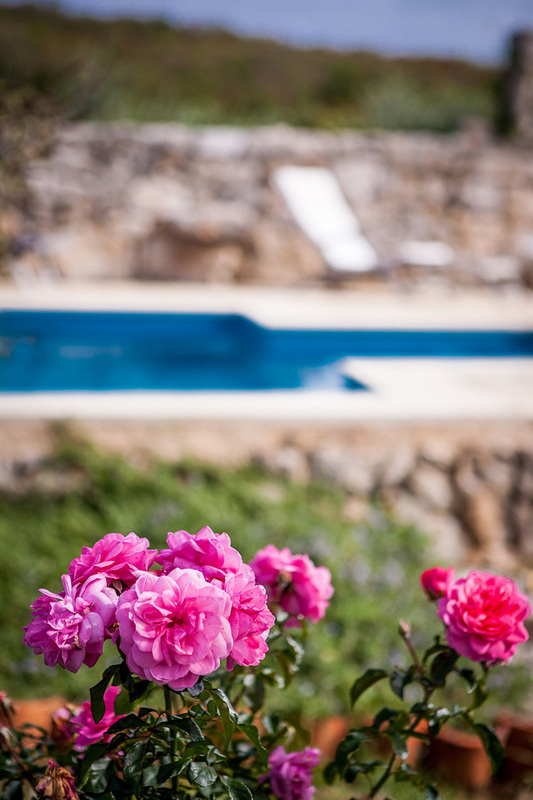 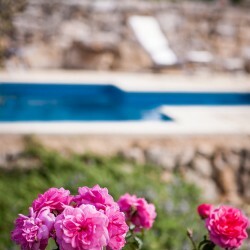 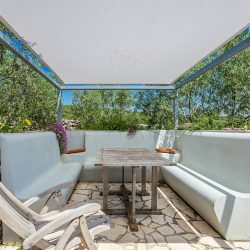 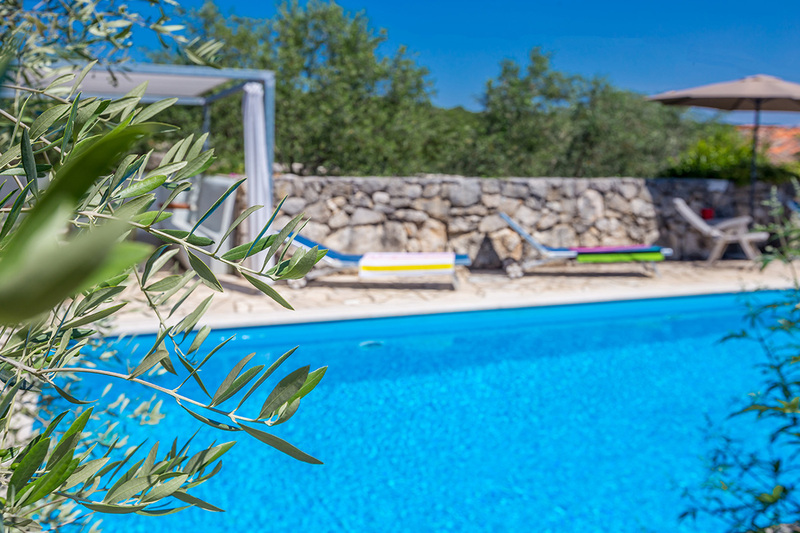 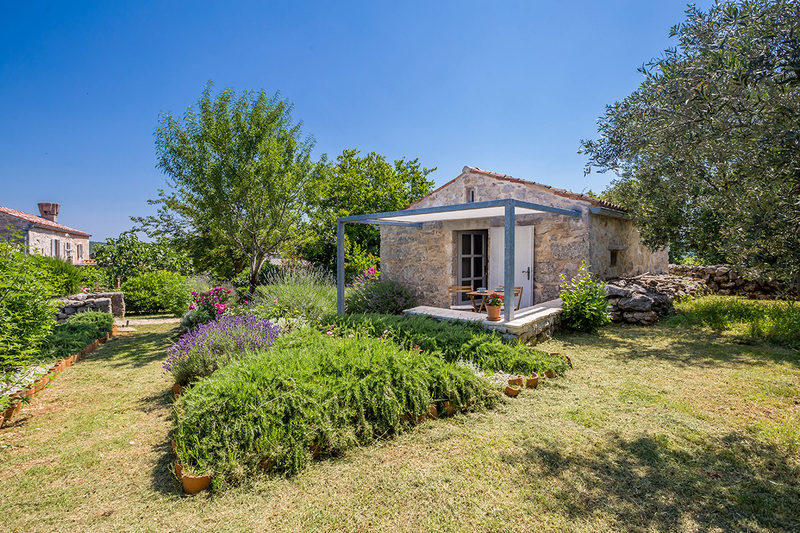 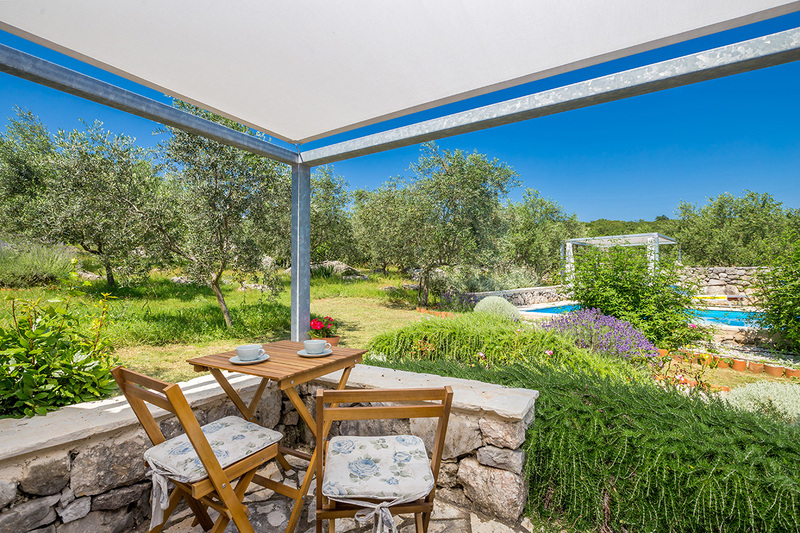 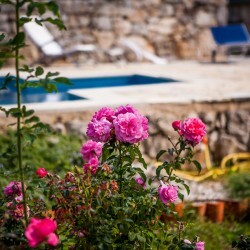 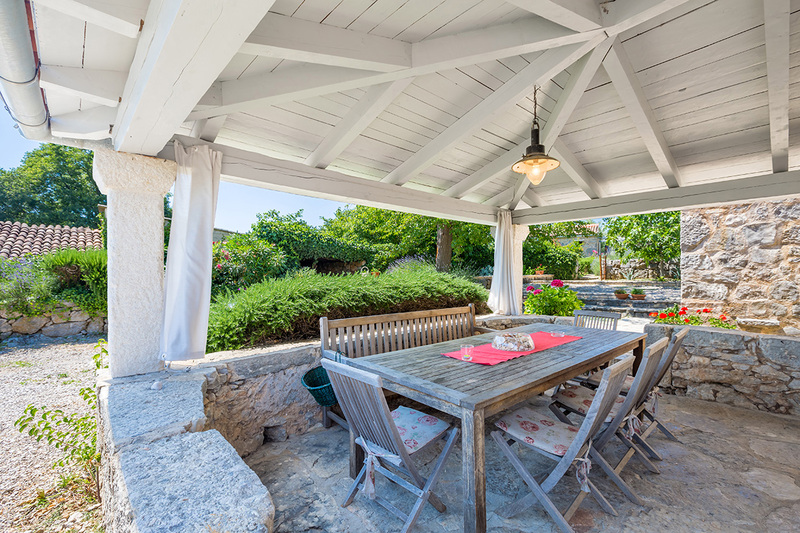 The big garden is decorated with a lot of mediteranean herbs and plants, as well as a fifteen year old olive grove with around 50 olive trees, surrounding the swimming pool and the sunbathing area. 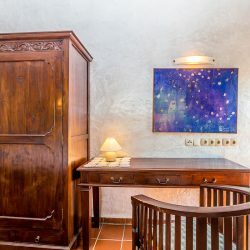 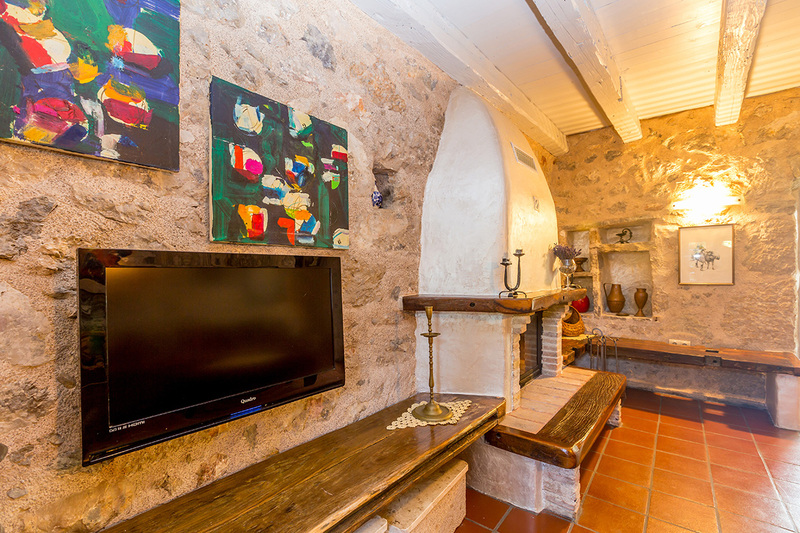 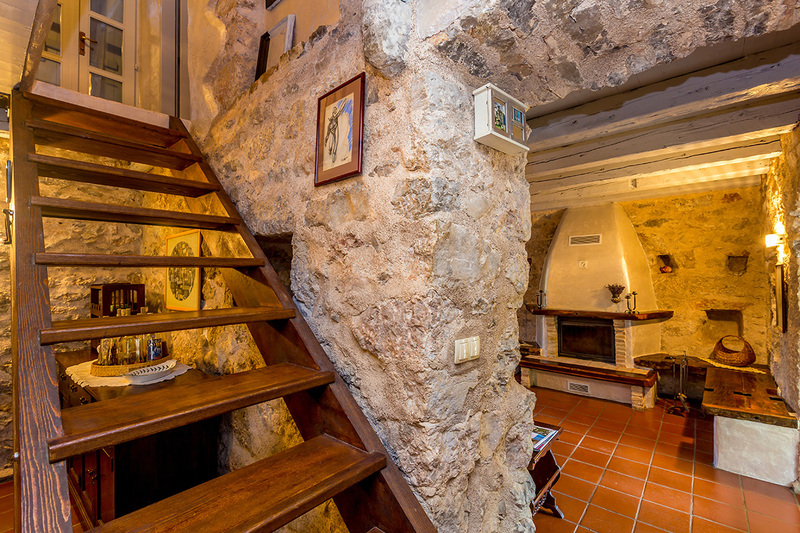 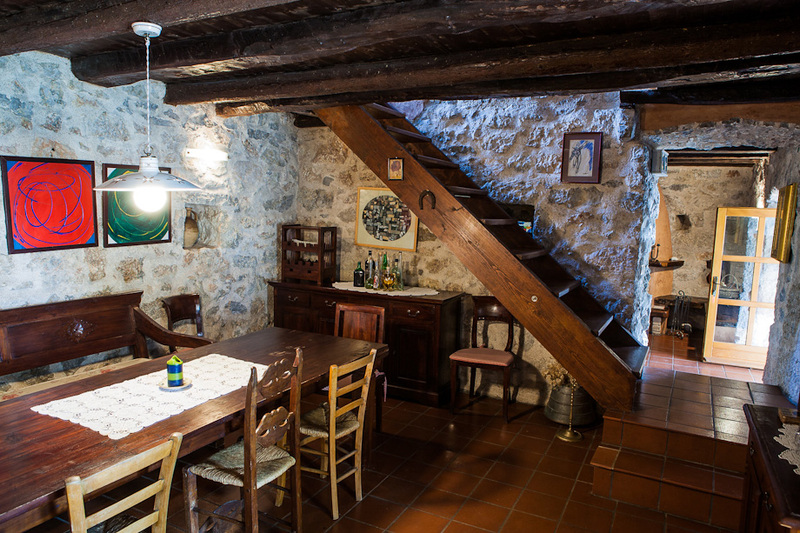 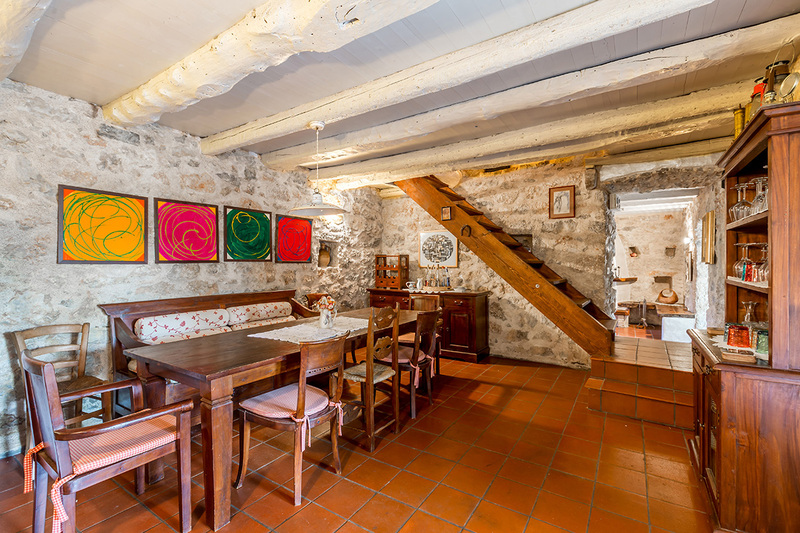 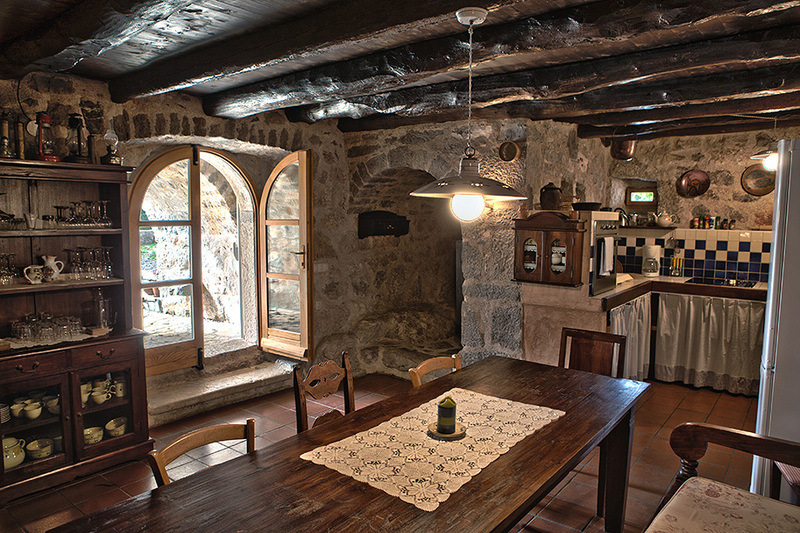 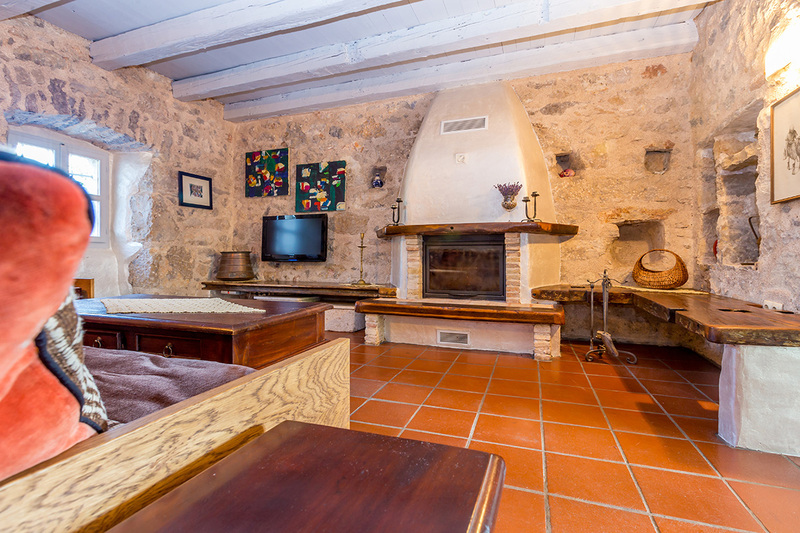 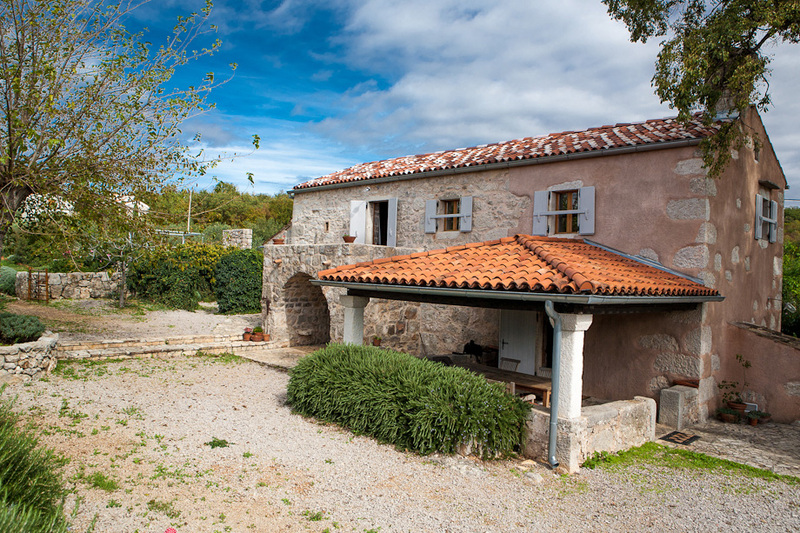 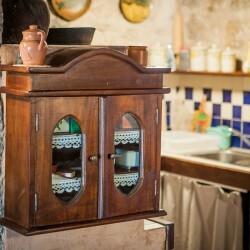 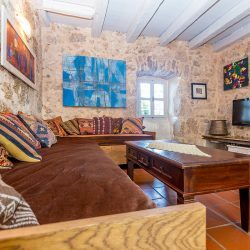 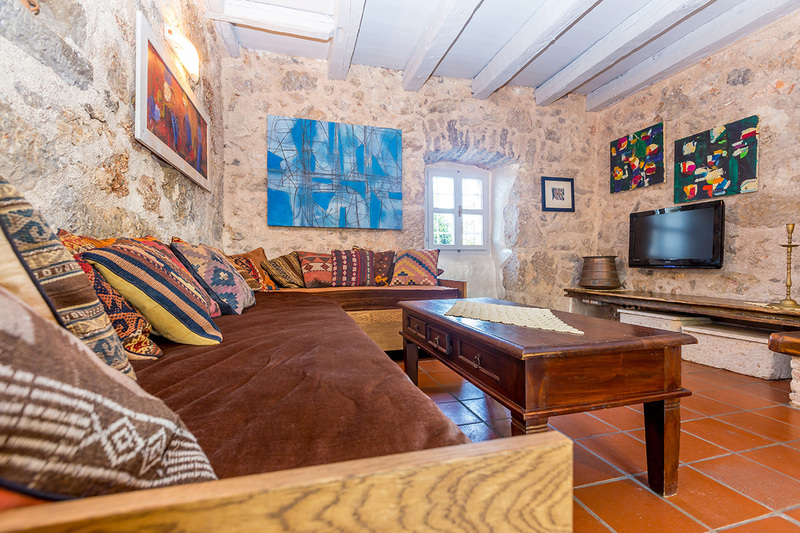 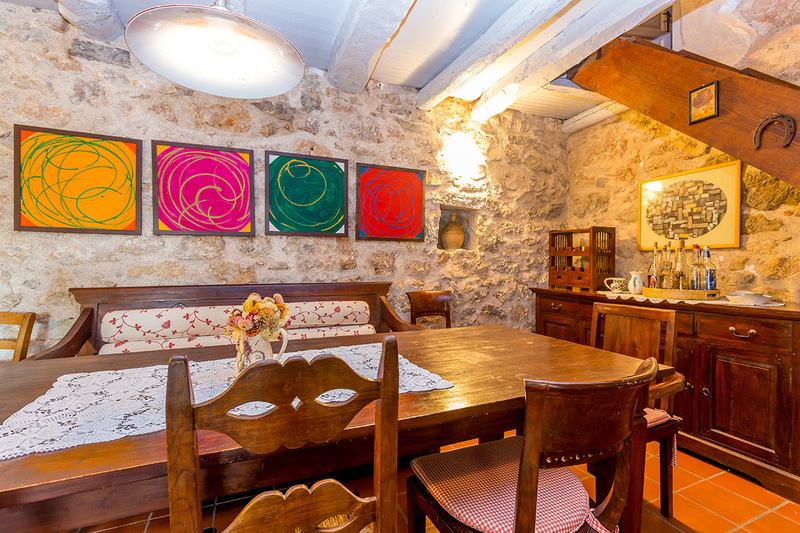 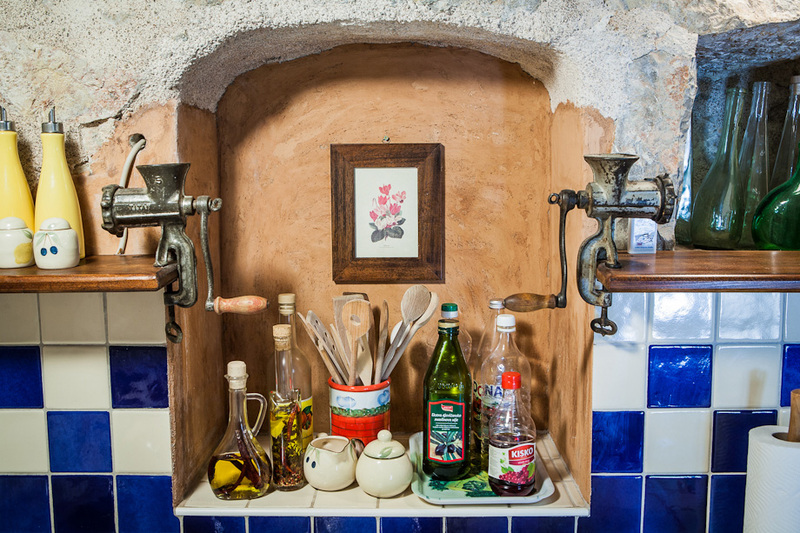 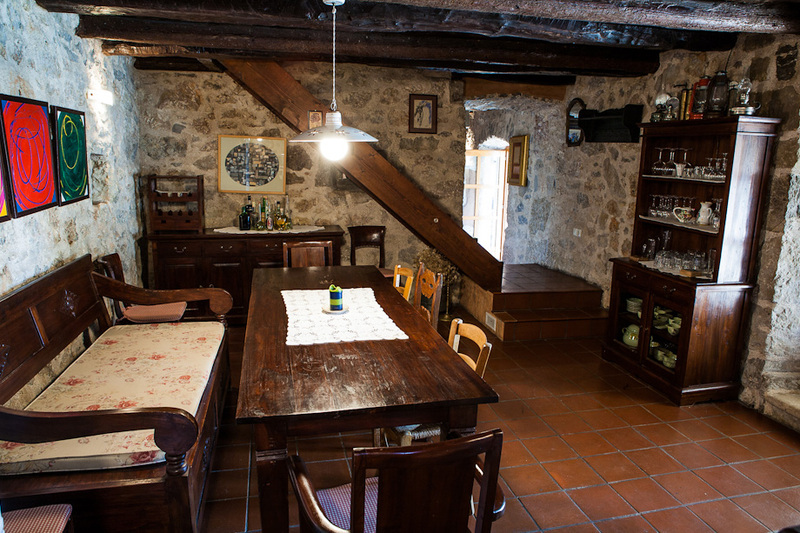 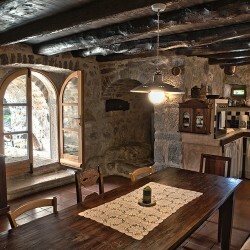 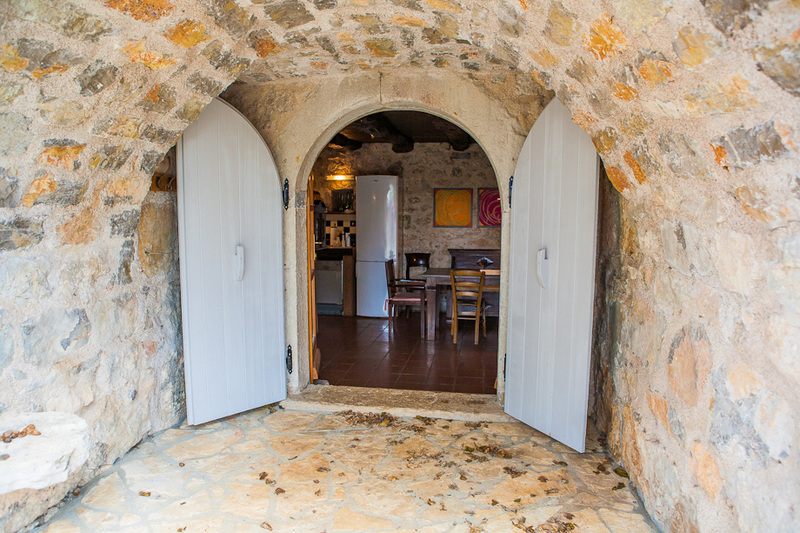 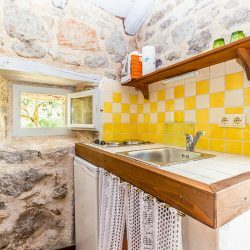 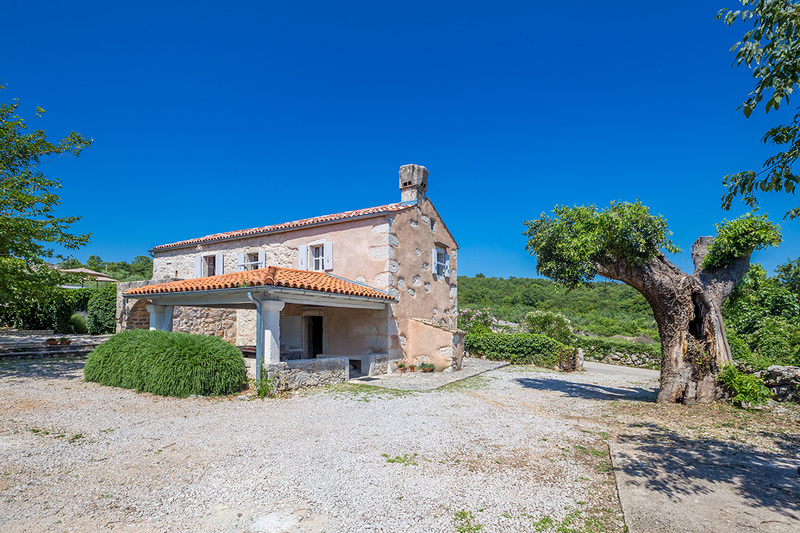 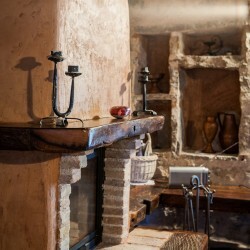 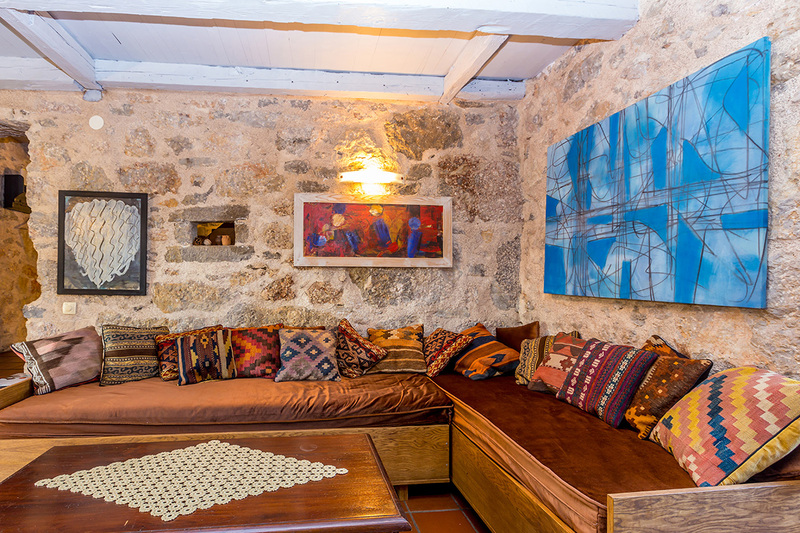 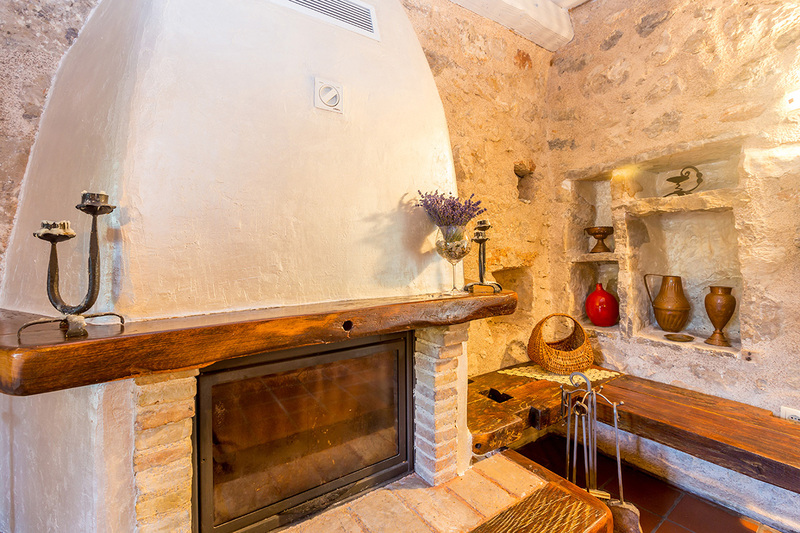 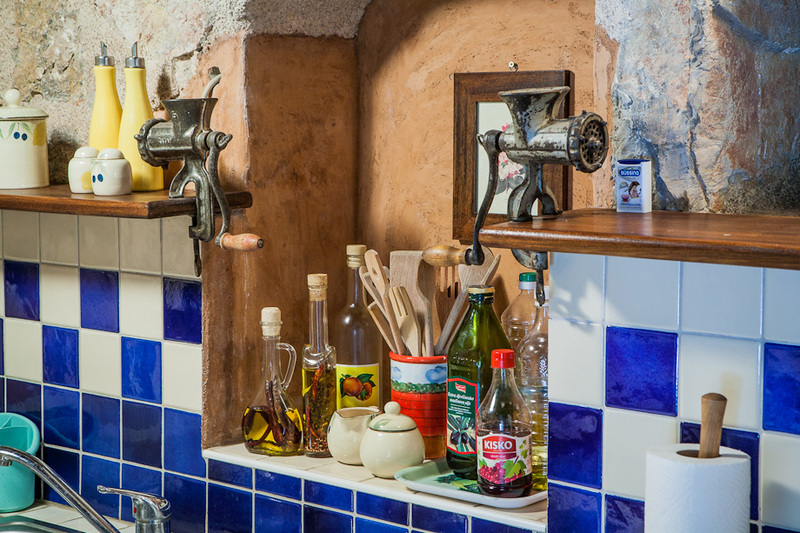 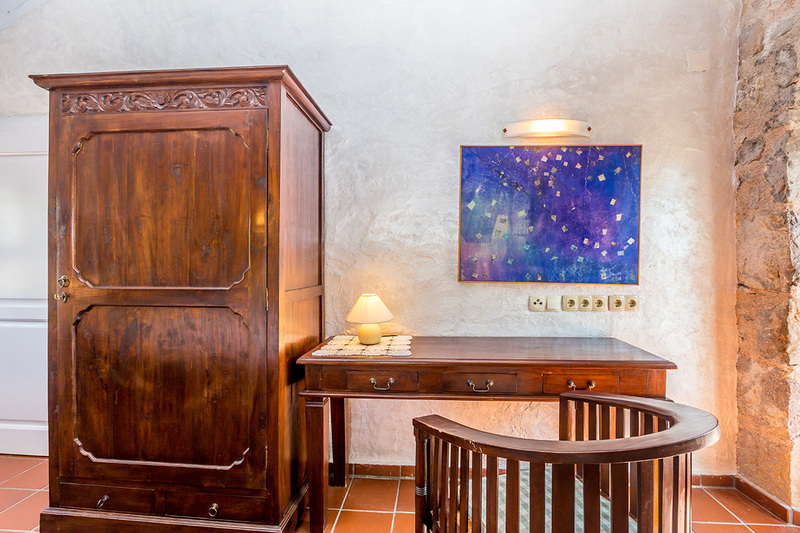 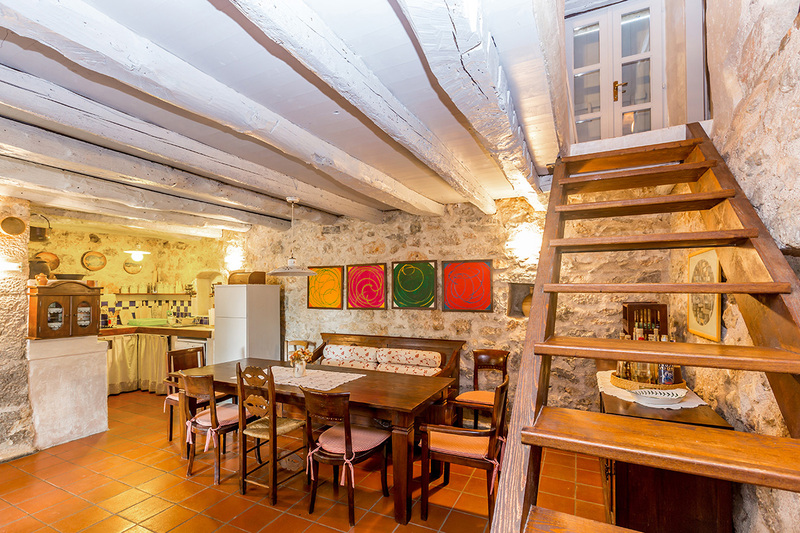 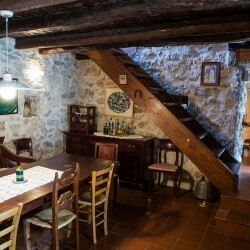 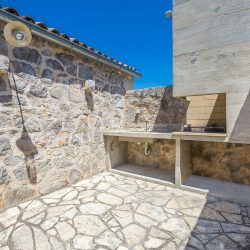 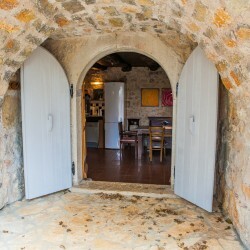 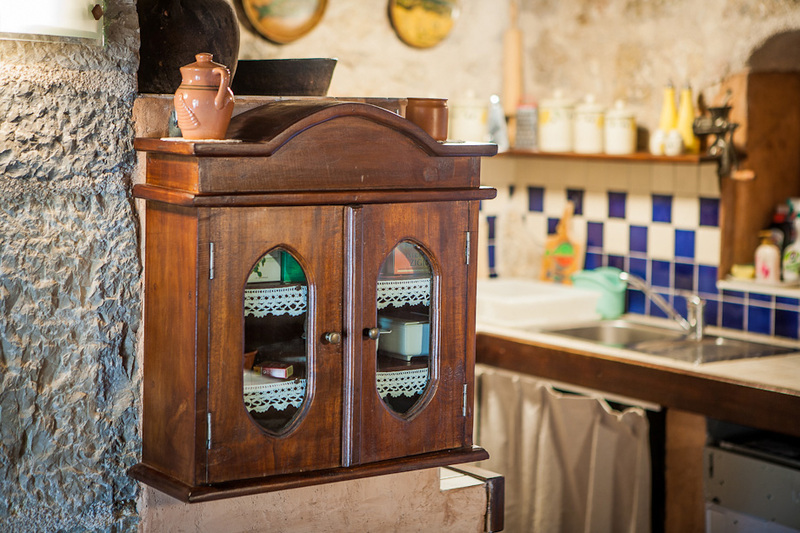 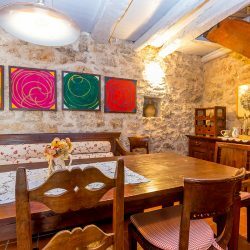 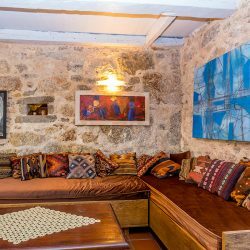 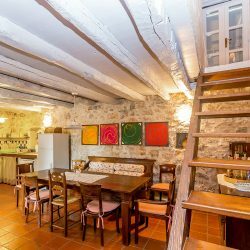 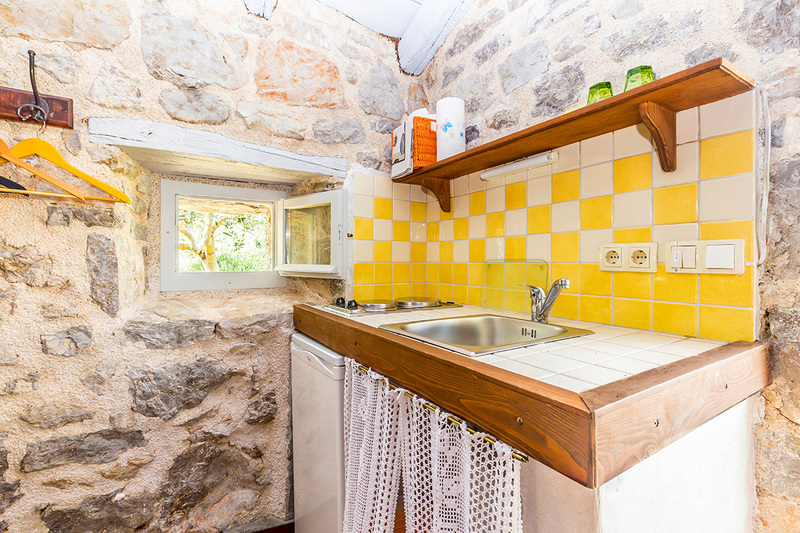 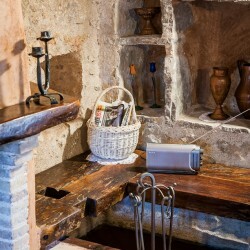 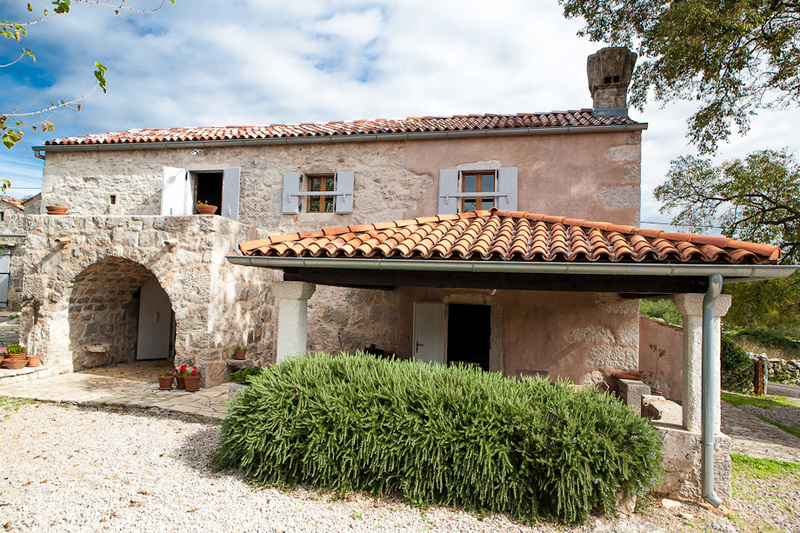 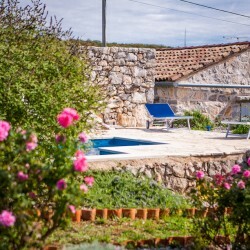 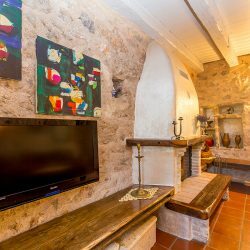 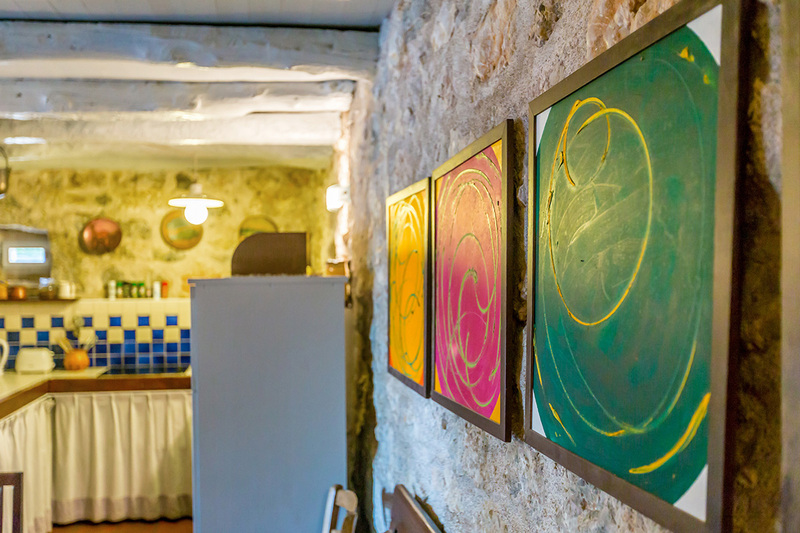 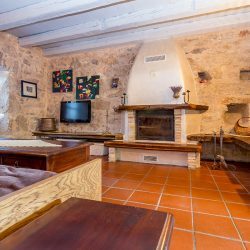 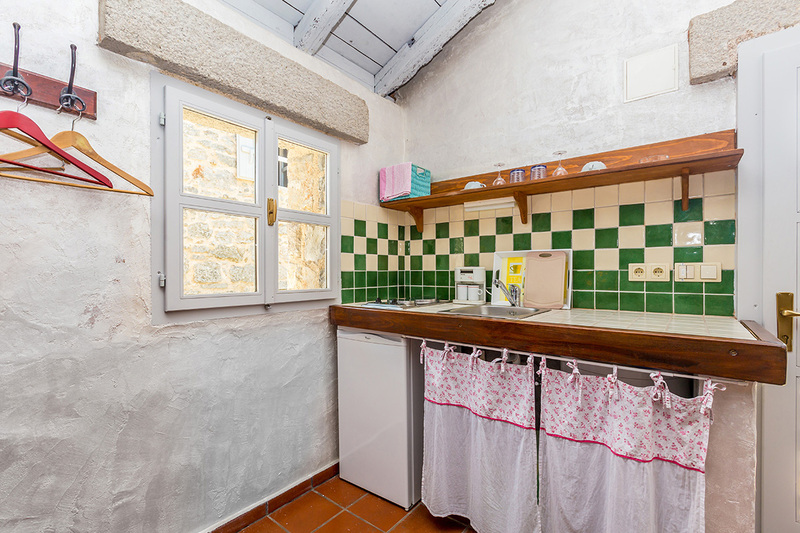 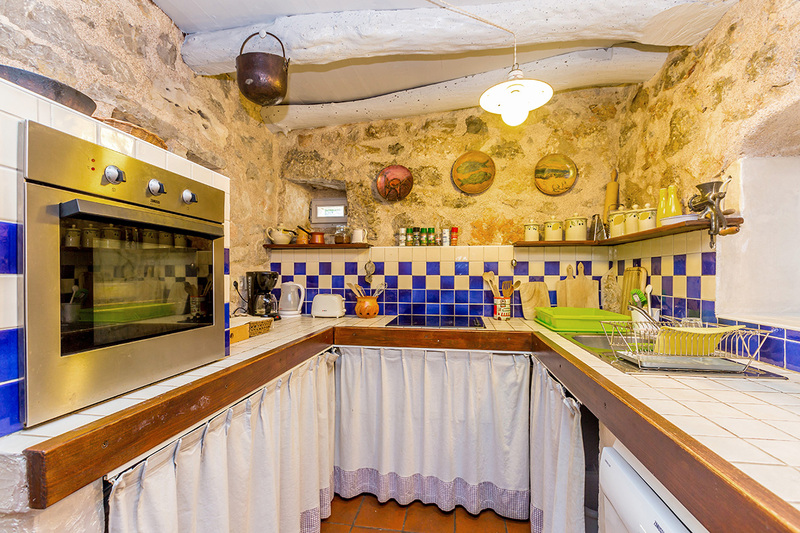 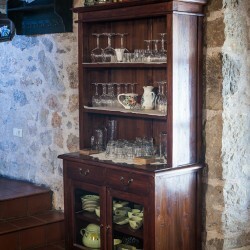 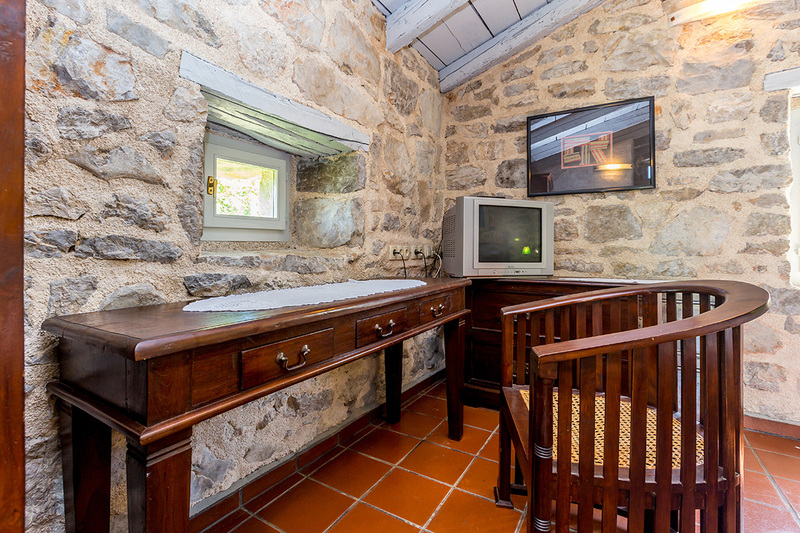 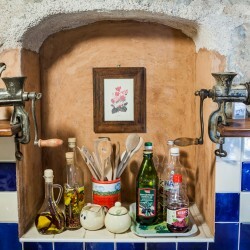 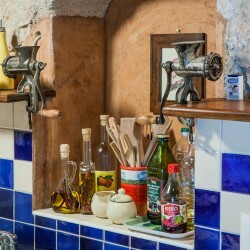 The house offers all necessary house and kitchen appliances, as well as satelite tv and a free WiFi connection. 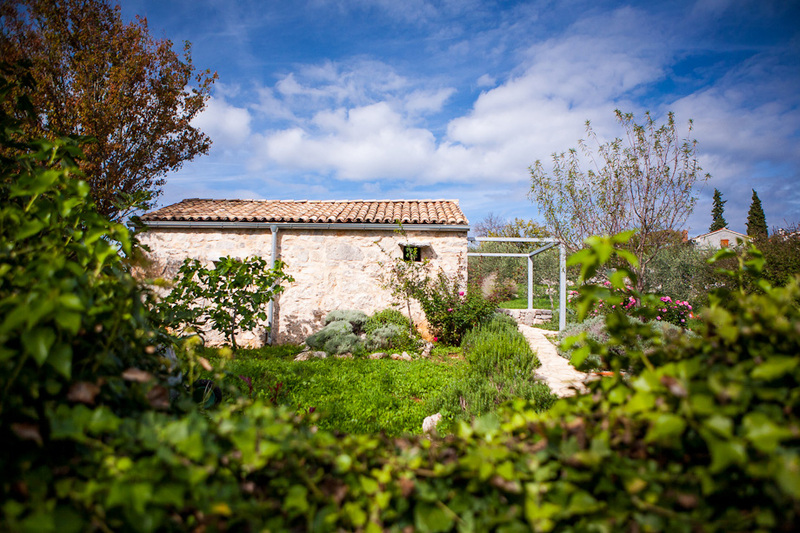 Part of the island where You will spend your holiday, the locals call „soto vento“, and is known for its mild climate with no wind. 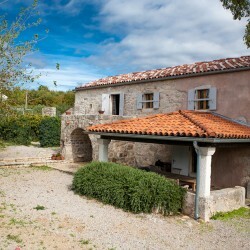 The area is facing a neighbour island of the Kvarner Bay – the island of Cres – which is easily accessible by ferry boat. 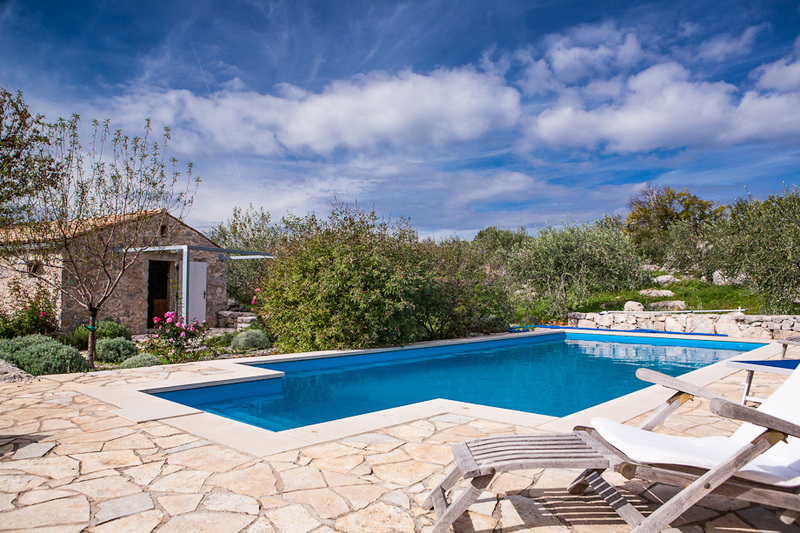 It will take you 10 min by car to get to the nearest beach, since the house is located 6km from the seaside. 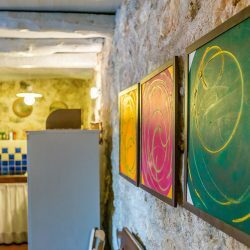 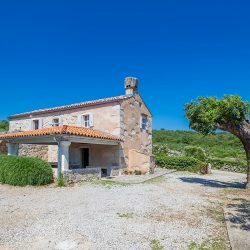 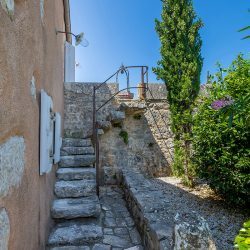 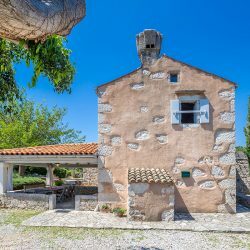 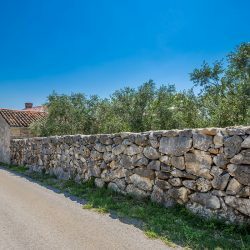 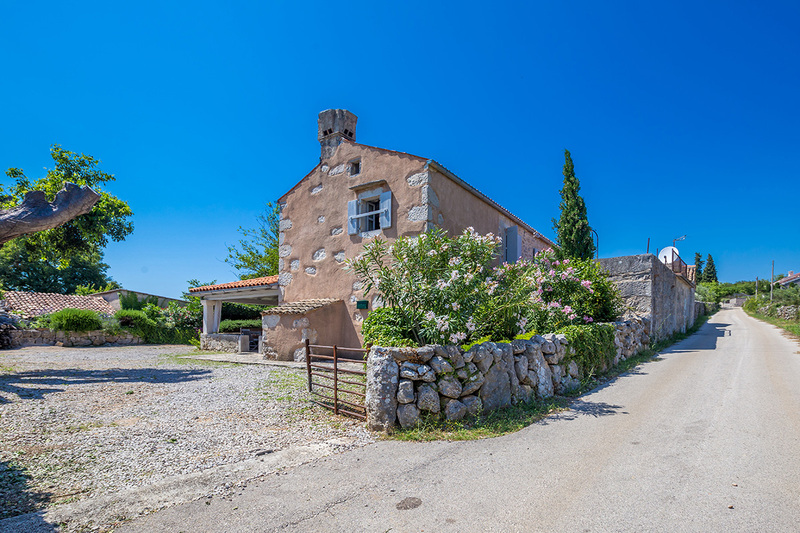 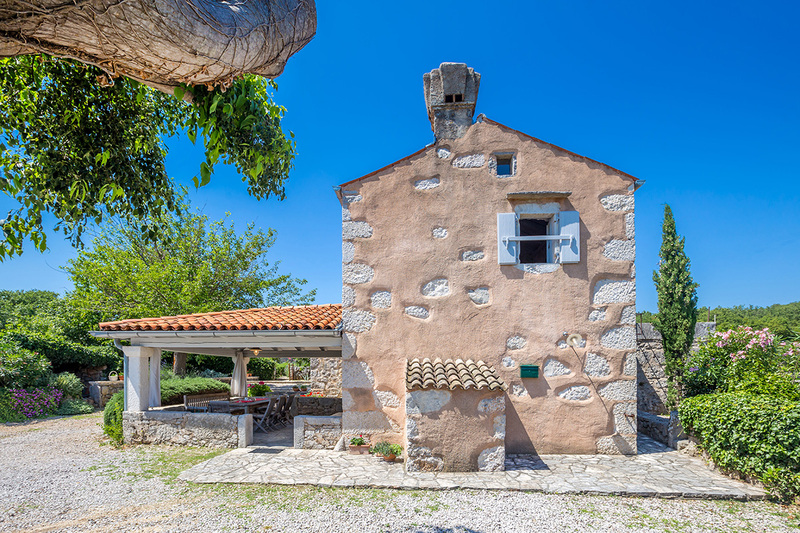 To reach Malinska or Krk, the nearest bigger towns, it will take you 15 min by car, driving through typical, interesting, small island roads going through nearby villages and lots of olive groves. 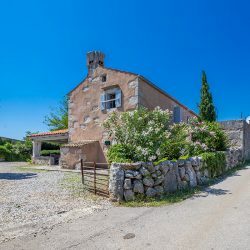 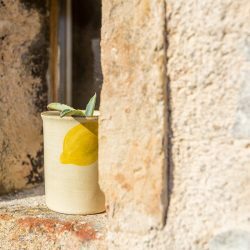 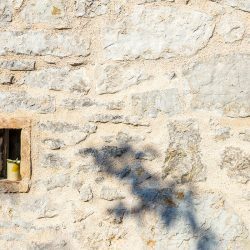 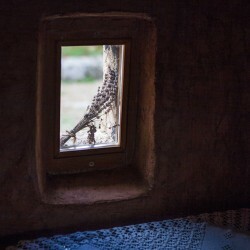 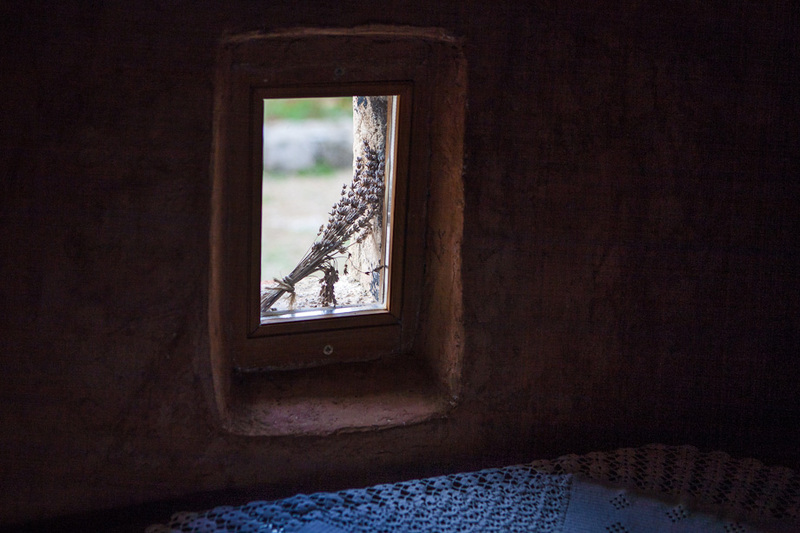 You might also get to see some sheep, rabbits, deers or quails if You decide to take a walk in the small village of Kapovci, especially early in the morning, or at sunset. 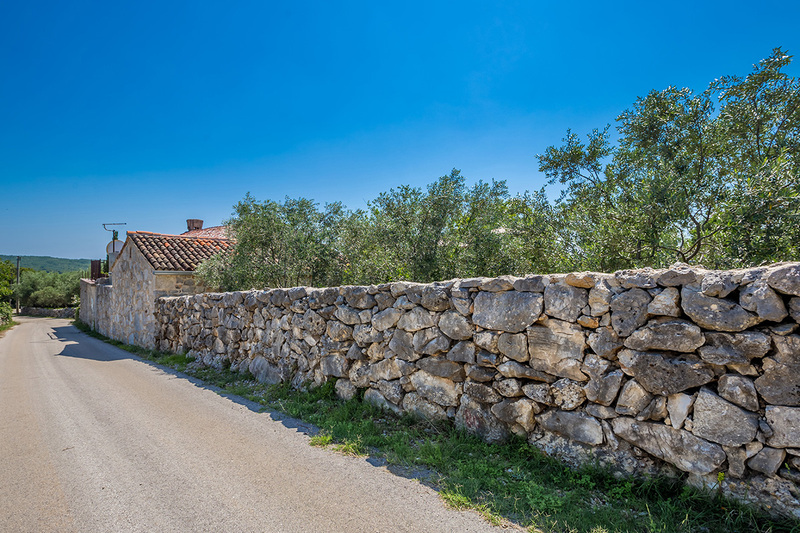 Besides wlaking around, You can also enjoy bicycle riding since the island of Krk has a lot of recently renovated bicycle paths. 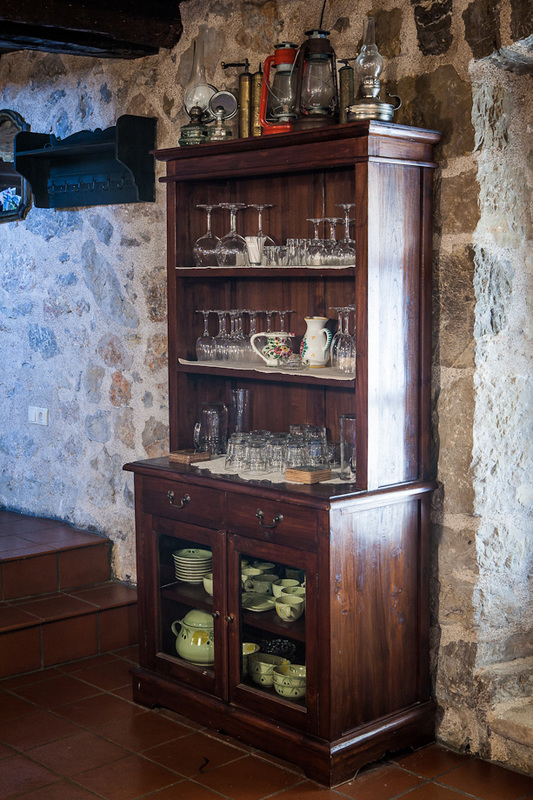 We would be more than happy to host Your pets too, since we also have one of our own. 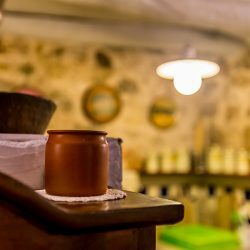 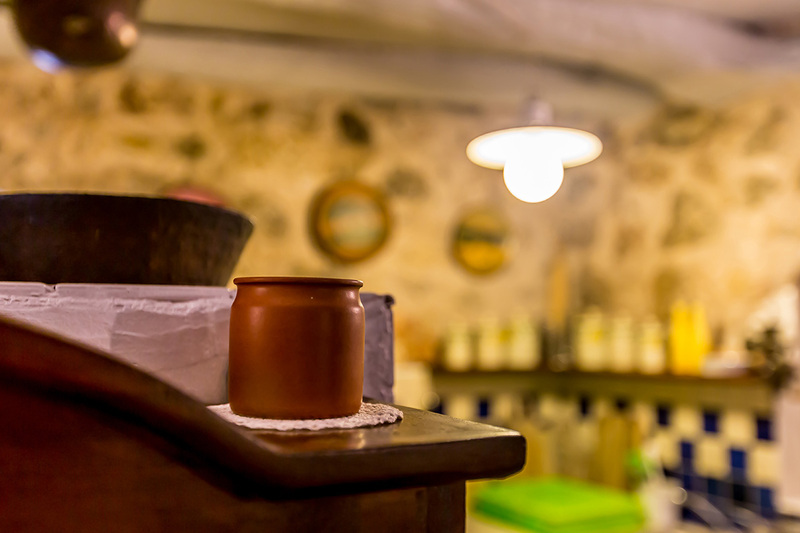 At the local green markets You can buy some organic fruits, vegetables, sheep cheese, olive oil, local wine, as well as a variety of meat or fish. 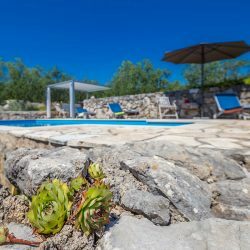 We believe You will not regret choosing our Villa for Your vacation, and we are sure You will come back, as well as a lot of our past clients still do.